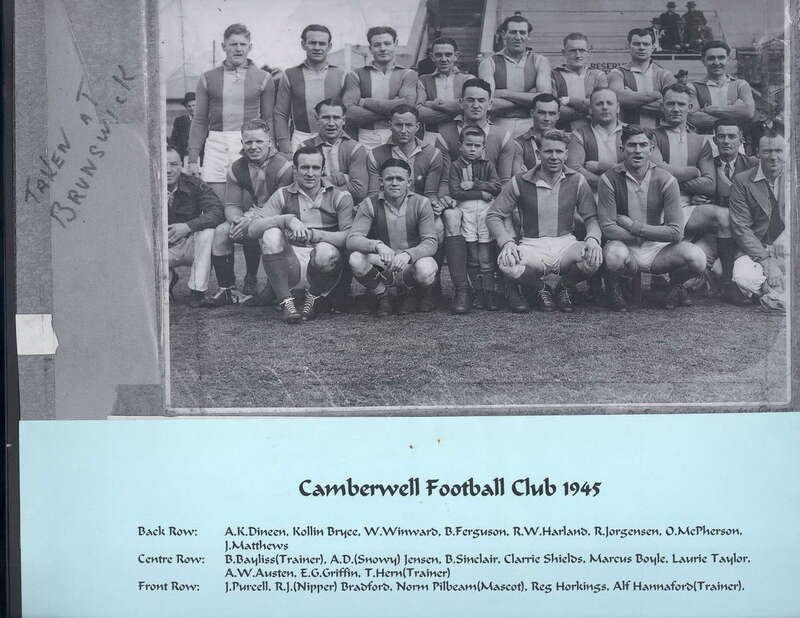 This is the second part of three articles on the History of Camberwell Football Club. We recommend starting from the first article Part 1 From the Junction to Nashville 1886-1941. 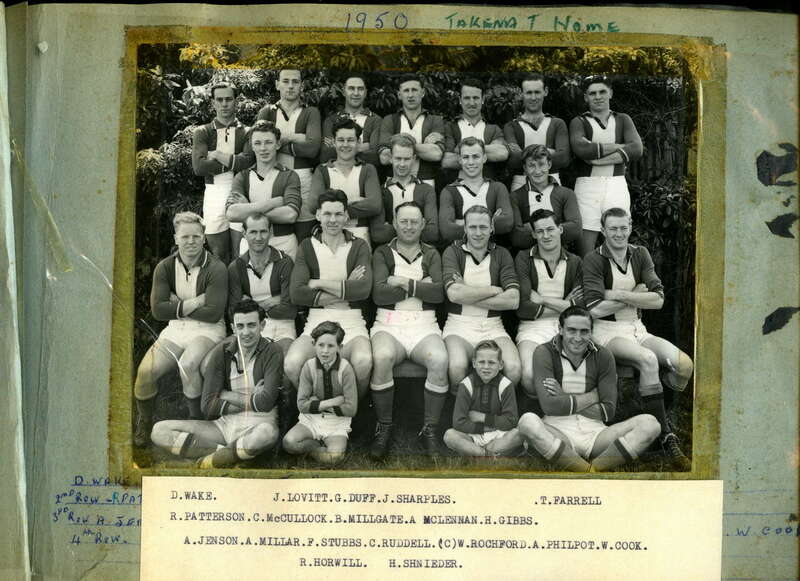 Some Camberwell players (1950-59) who played senior football in the VFL (for a complete list see Part Three). Camberwell started the season with a team that bore very little resemblance to the one that had taken the field in 1941. 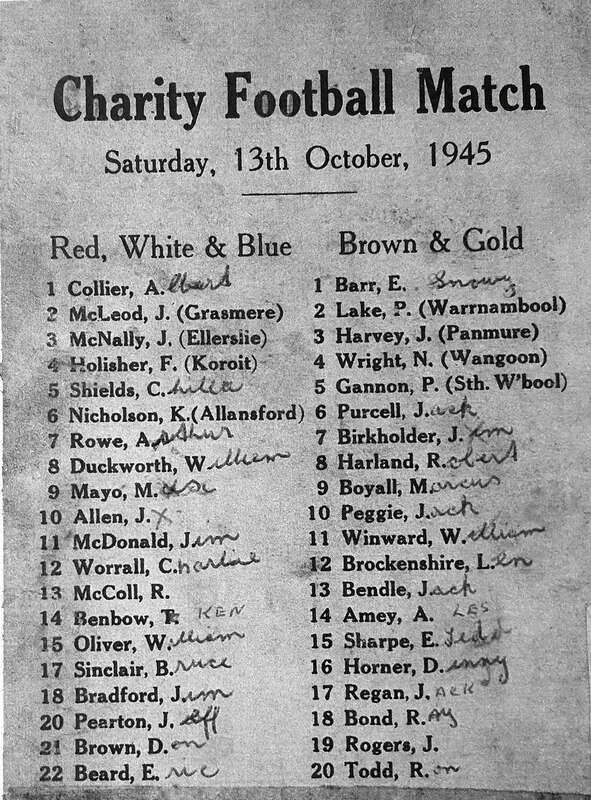 Apart from Nash and Cazaly, 1941 players who were missing included George Bennett, George Clamp, Reg Henderson, Ian McKay, Stan Spinks, Jim Toohey and Harry Whitehead. Those players who had returned to Camberwell after the war were not many - Bob Austen, Reg Horkings, Barney Jorgensen, Owen McPherson, Bill Olliver, Laurie Peters, Arthur Rowe, Jack Seelenmeyer and Laurie Taylor. On the other hand, Kollin Bryce, Ken Dineen, Bob Harland, Jack Matthews, Clarrie Shields, Bill Winward, Alan Jensen, Tom Campbell, Alan McDonald, Bruce Ferguson, Bruce Sinclair, Eddie Griffin and Russell Elliot were all new players, as were the three big-name acquisitions from Collingwood – Jim ‘Nipper’ Bradford, Marcus Boyall, and Albert ‘Leeter’ Collier. 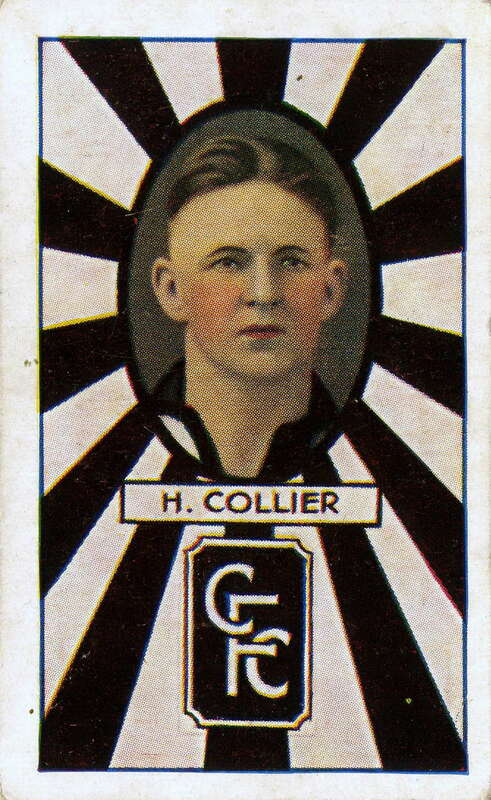 Collier, the 1929 VFL Brownlow Medallist, was cleared by the Magpies and appointed Camberwell captain-coach. 2 Collier, about to turn 36, proved to be an inspiring leader, despite his temporary absence during the season with the RAAF. (Collier returned for the August 18 match against Preston). The nippy Bradford more than lived up to his nickname and, despite suffering head injuries and shock mid-season when his car overturned, won the first of his two Camberwell best and fairest awards. 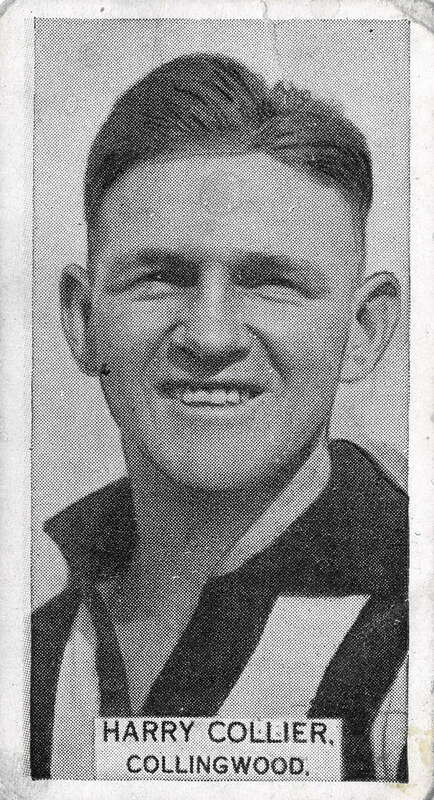 Boyall, centre half back in two losing Collingwood Grand Final sides (1937, 1938) and a Magarey (South Australia) Medallist, played his first game for Camberwell on June 23 against Brighton and was soon saddled with coaching duties in the absence of Collier. Camberwell won only three of the first nine games but then turned the season around by winning nine of the last eleven to finish fourth after the 'home and away' games. 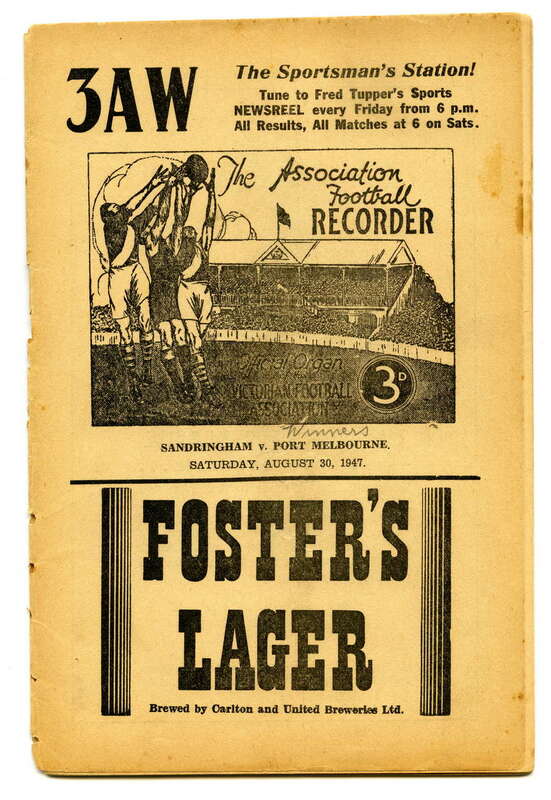 Unfortunately, Port, led by the two 35-year-old veterans Tom Lahiff and Ted Freyer, was too good for the Tricolours in the First Semi Final played at St.Kilda, winning by 54 points. Reserves – Owen McPherson, Jack Seelenmeyer, Bruce Sinclair. Out: Olliver (injured), Seelenmeyer, Sinclair. First Semi Final – September 15 – Junction Oval – Umpire Merrington – Fine and Sunny. Goals Camberwell – Campbell 5, Bryce 2, Dineen 2, Austen 2, Matthews 1, Harland 1, McDonald 1, Bradford 1. Goals Port Melbourne – Houston 6, Culph 5, Freyer 3, Reynolds 3, Taylor 2, Lahiff 2, Fletcher, McBeth. Bradford 48, Olliver 42, Dineen 24, Harland 21, Jensen 15, McDonald 15, Jorgensen 14, Campbell 14, Griffin 13, Bryce 12. 1 – J.Peggie (4), G.Harland (1), K.Price (1). Goals – Bradford 4, Jorgensen 2, Olliver 2, Griffin 2, Bryce 2, Shean, Harrison. 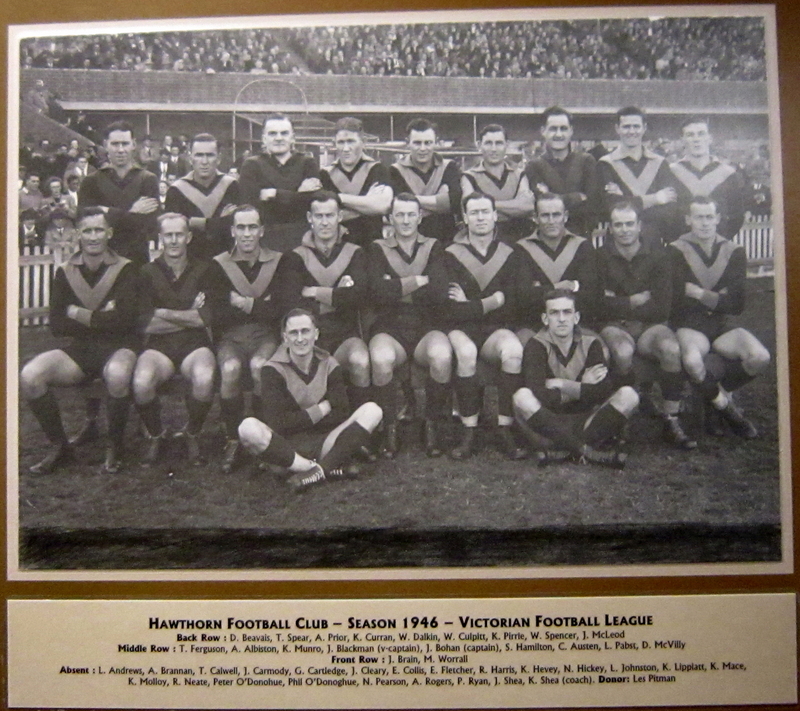 1945 team photo belonging to Norm Pilbeam. Image originally from Thelma Baker scrapbook borrowed by Norm’s Aunty Tess from her friend Thelma Baker about 2003. Back row – Ken Dineen, Kollin Bryce, Bill Winward, Bruce Ferguson, Bob ‘Donkey’ Harland, R.’Barney’ Jorgensen, Owen McPherson, Jack Matthews. Centre row – Alan Jensen, Bruce Sinclair, Clarrie ‘Chilla’ Shields, Marcus Boyall, Laurie Taylor, Albert ‘Bunny’ ‘Bob’ Austen, Eddie Griffin. Front row – Jack Purcell, Jim Bradford, Ron Lawes, Reg Horkings. Mascot - Norm Pilbeam (5 years). Norm Pilbeam, nephew of Charlie Clamp junior, won Burwood Football Club's best and fairest award 1964. Pre-season activity at Bowen Street reflected this same sense of optimism. The Camberwell club distributed 3000 free membership tickets to school children in areas from Glenferrie to Ferntree Gully. As the season proper got underway Camberwell supporters grew ever more excited. The Tricolours shot out of the blocks to win their first seven matches (new full forward Max Mayo having kicked 38 goals to that point). In Round One, at Oakleigh, Camberwell thrashed the home side 26.16 to 12.13, with new player Max Mayo kicking seven goals, Bradford 5 and Bryce 5. Though they came back to the rest of the field – losing four games and drawing another – Camberwell remained on top at the conclusion of the home and away season and were the clear flag favourites when the final series got under way. Camberwell’s best were Boyall, Sharples, Bradford, Horkings, Collier, Bryce, McIvor, Olliver, Naismith, and Burkhalter. Olliver kicked five goals, Bryce three, Bond two, and Bradford and Herbert one each. Enter new Zebra playing-coach Len Toyne, formerly of Geelong and Fitzroy. Clinton Walker describes Toyne’s tactical trademark of kicking against the wind. The idea that the younger legs in his super-fit and speedy team would run all over the opposition in the last quarter obviously worked. 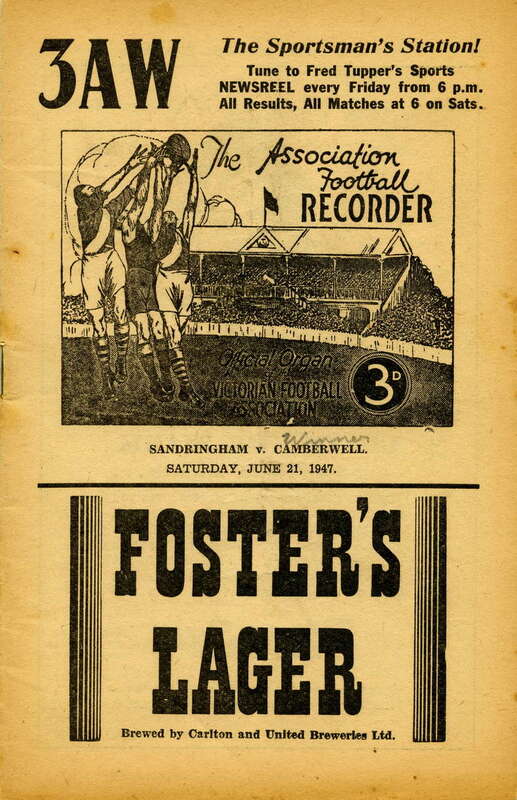 In a 1946 game at Camberwell, Sandringham, kicking five very late goals, won after being 27 points behind with four minutes to play. In the 1946 Preliminary Final against Williamstown the Zebras, down 40 points at three quarter time, kicked 8.2 in the last seventeen minutes to win by a point. 30,000 people, taking advantage of the sunny weather, packed into the St.Kilda ground to witness one of the all-time classic VFA Grand Finals. Camberwell, kicking with the south west breeze, jumped away to lead by 29 points at the first change but were pegged back emphatically in the second quarter. The Tricolours led by two points at the last change. The gripping, nail-biting finish is legendary – Sandringham seven points down at the start of time-on, then kicking 2.2 to win by seven points. Bryce 61, Bradford 50, Mayo 49, Olliver 34, Herbert 21, Boyall 19, Shields 18, Bond 17, Anderson 13, Bristowe 12, Jensen 11, Harland 10. The biggest early-season news at Bowen Street in 1947 was the arrival of star Hawthorn player Jim Bohan, renowned for his magnificent kicking. 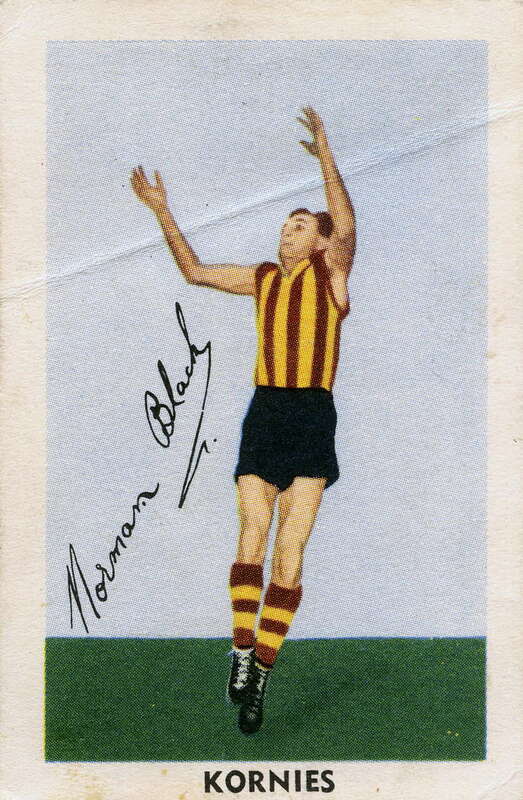 Bohan, a Victorian representative and captain of Hawthorn in 1946, left the Hawks without a clearance. 14 After the hype and excitement of 1946, Camberwell’s 1947 brought bitter disappointment for its fans, particularly as the club lost six of the last seven games (two of them very badly) and finished out of the four - seventh with ten wins and twelve losses. Along the way there were positives however. A massive crowd of 10,000 turned up for the first match of the season at Camberwell and saw the Tricolours trounce Oakleigh by 50 points. In Round 8, again at home, they soundly defeated Port Melbourne by 44 points, new forward John McDonald kicking seven goals. 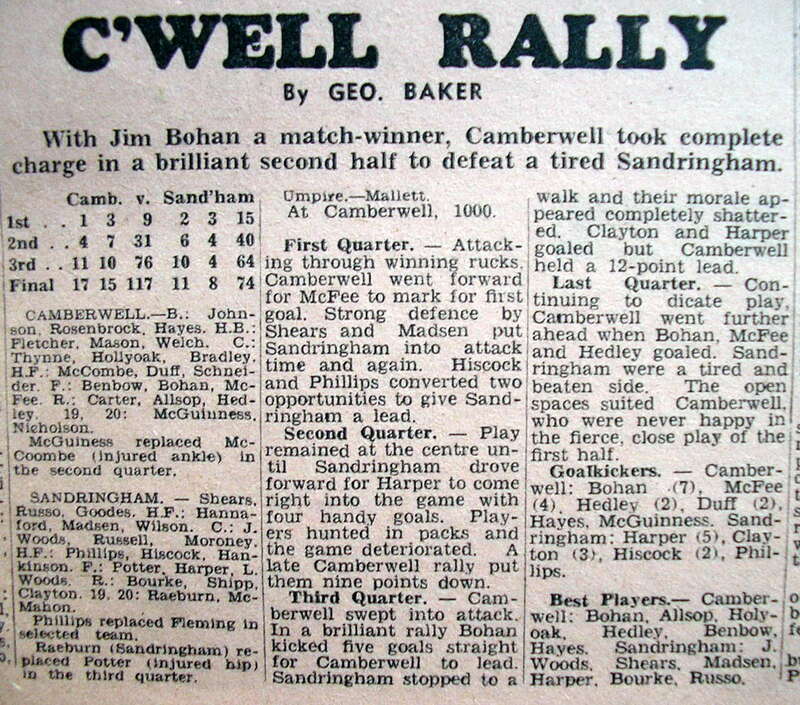 The most satisfying Camberwell victory of 1947 however would have been the three point win, playing away, against Sandringham in Round Eleven, a match Camberwell all but threw away with atrocious kicking for goal (12.31). Marcus Boyall, appointed captain-coach, relinquished his leader role after ten Rounds. 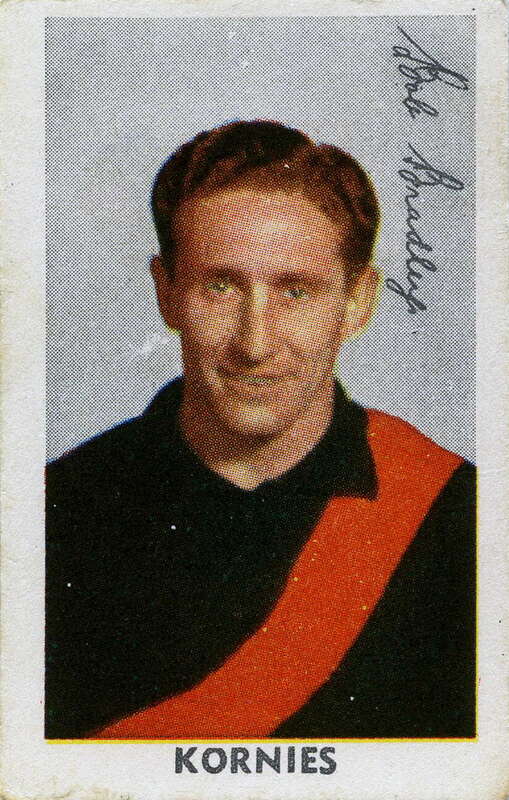 He continued as a player and won the 1947 best and fairest award. 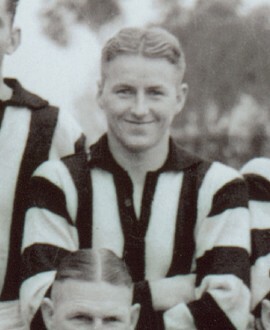 Boyall’s replacement as captain-coach was the 39-year-old former Collingwood captain and 1930 Brownlow Medallist Harry Collier. Marcus Boyall, Clive Kinder, Jim Bradford. Attendance 5000 at Camberwell. C’well 2.1, 7.6, 8.8, 9.9; W’town 2.5, 5.8, 7.11, 10.16. J.McDonald 47, Bohan 39, Campbell 33, Bradford 32 (130), Olliver 32 (122), Bryce 27 (100), Herbert 19, McIvor 14, Hogan 13, Boyall 12, Jensen 10, Kinder 6, Bristowe 5, H.Collier 5. Camberwell appointed former champion centreman Roy Williams as non-playing coach. Some big names were missing in the 1948 list when it was announced, six of them from the 1946 Grand Final side - Boyall, Naismith, Bryce, Olliver, Taylor, and Horkings – plus Harry Collier and Tom Campbell. The club’s new recruitment policy of prioritising young local players was evidenced by the fact that 44 players were used during the season. Of the twenty who were new, Alec Millar, Wally Cook, Norm Unstead and Reg Fletcher stood out, along with Furlong and Page. P.Barbeta, Jim Bohan, George Bradford, Jim Bradford, Wally Bristowe, Jim Burkhalter, W.Coghlin, George Cracknell, A.Flowers, F.Furlong, A.Gale, Cliff Hanman, Ken Herbert, P.Hogan, Dal Kennedy, Clive Kinder, Ron Lambden, Ken Mace, Alec Millar, Ivor McIvor (capt), A.McCreachan, John McDonald, Jack Seelenmeyer, Les Shelley, Jack Sharples, C.Short, Gordon Styles, Frank Stubbs. SUPPLEMENTARY: Barton, Bayliss, Bendle, Bennison, E.Bristowe, Campbell, Dempster, Ferguson, Fletcher, Gordon, G.Hale, J.Hale, Harris, Hayes, Ingram, Jensen, Lester, Pitman, Rochford, Shean, Smart, Thompson, Unstead, Wickham, Woodford, Yole. Camberwell started the season well, winning six of the first eight matches, before sliding back into the ruck, losing six of the last eight to finish seventh. On the way there were good wins against Port (twice) and eventual premiers Brighton at Brighton. The state of the Camberwell Oval was of some concern, with one (local Williamstown) newspaper account of the Round 9 slog against Williamstown railing against the Bowen Street mud heap - 'Seldom has a football match been played under such conditions as prevailed on Saturday at Camberwell, the oval resembling a sea of mud rather than a football ground'. Goals – Bohan 5, Hanman 2, Furlong 2, Page, Monohan; Best – Furlong, Bohan, Hanman, Bradford, Unstead, Monohan. Williamstown exacted revenge (for the Round 9 mud) in the return encounter at Williamstown, thrashing the visitors by 92 points. Goals – Bohan 3, McIvor, Herbert, McDonald, Jensen; Best – Bohan, Stubbs, Jensen, Herbert. OLD – Benbow, Bohan, Connell, Cook, Cracknell, Fletcher, Flowers, Furlong, Herbert, Jensen, Joubert, Kennedy, Millar, McIvor, Rochford, Sharples, Stubbs, Unstead. NEW – Brentnall, Davis, Duff, Finnegan, Foote, Hester, Heavey, Lovitt, Philpott, B.Taylor, Turvey, Zampatti. SUPPLEMENTARY – Allan, Arthur, Barbeta, Barnard, Fisher, Grigg, Houry, Hicks, Lanning, Moore, Osbourne, Wake. TO BE CONSIDERED – Bradford, Campbell. Herbert 11, Jensen 10, Finnegan 7, Sharples 3, Milgate 3, Rochford 2, Unstead 1, Cook 1, Lovett 1. Milgate 63, Bohan 45, Finnegan 25, Stubbs 19, Jensen 19, Herbert 16, Philpott 11, Cracknell 10, Rochford 10. Former Collingwood champion. Appointed Camberwell captain-coach 1945 as 35 year-old. 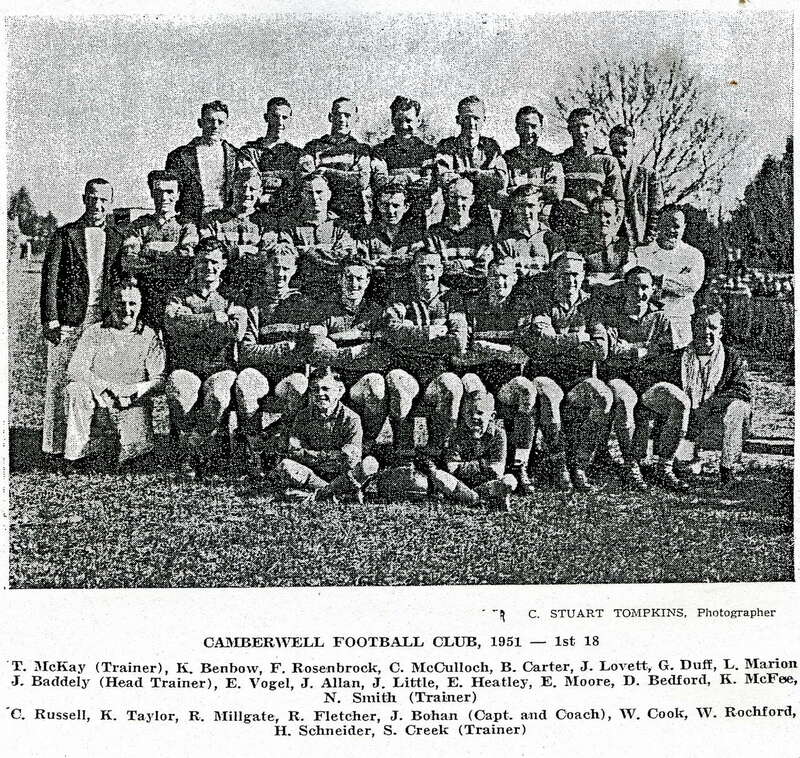 Camberwell 1945-46 (36 games). 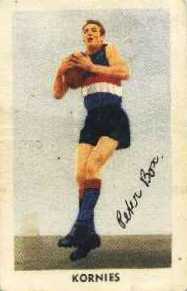 Collingwood 205 games (1925-30, 1933-39), Fitzroy 12 games (1941-42). 1929 Brownlow Medallist. Australian Football Hall of Fame member. See profile, Marc Fiddian, Well Done Camberwell, p. 36. Recruited from Collingwood 1945. Collingwood 7 games 16 goals (1943). 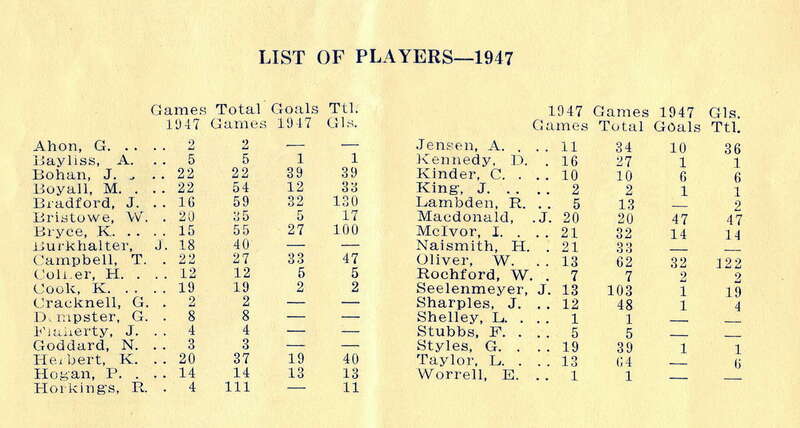 Camberwell 76 games and 169 goals (1945-48). 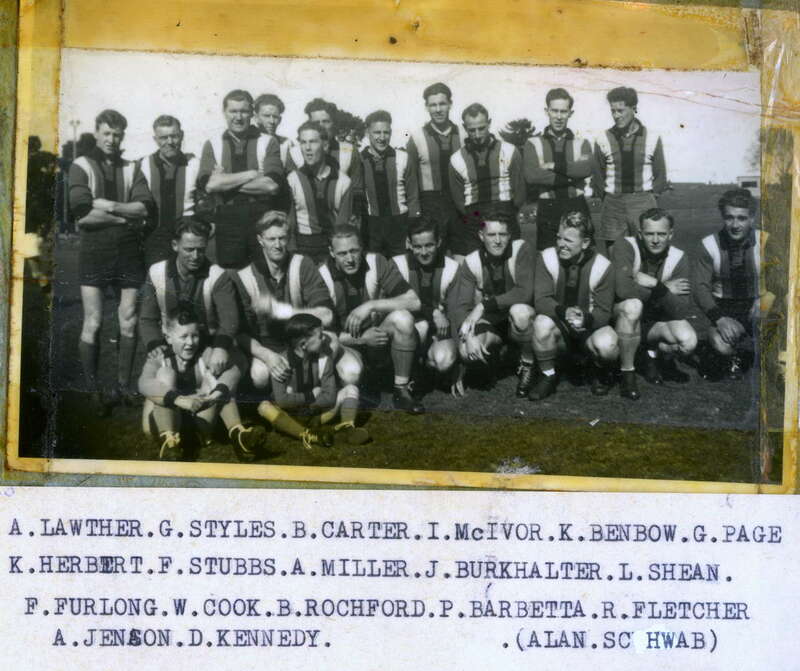 Camberwell best and fairest 1945, 1946. Camberwell goals (48, 50, 32, 39). VFA suspension Round 17, 1947. Left to North Melbourne – 9 games, 8 goals (1949). 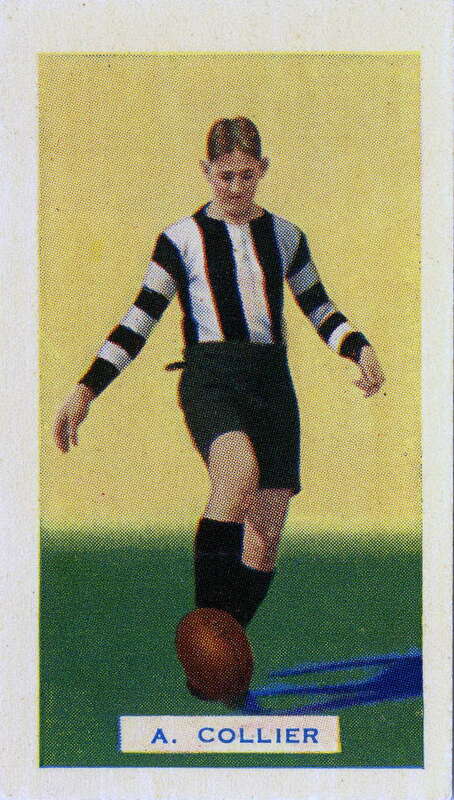 ‘Collingwood’s smallest ever player’ – 5’ 1’’ (Holmesby and Main). Camberwell 54 games (1945-47). Appointed Camberwell captain-coach 1947 but relinquished the role after ten matches. Camberwell best and fairest 1947. 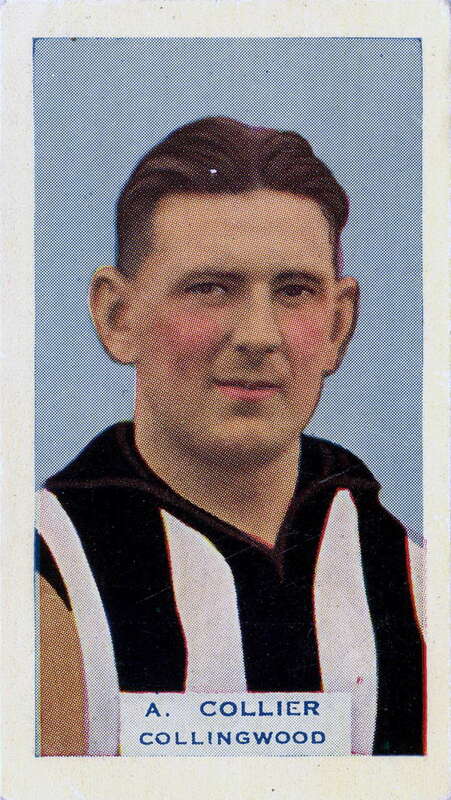 Collingwood 50 games 29 goals (1935-38, 1942, 1944-45). Collingwood centre half back in losing Grand Finals 1937, 1938. Equal third 1938 Brownlow Medal. 1936 Gardiner Medal (VFL Seconds). Magarey Medal (Glenelg) 1941. Ex-Auburn. Camberwell 111 games (1937-41, 1945-47). Hawthorn 34 games (1942-44). 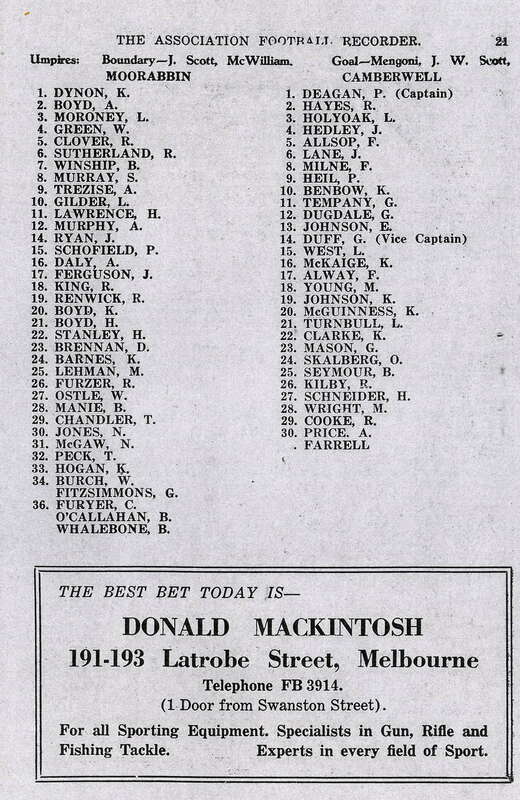 Camberwell best and fairest 1940. Camberwell Team of the Century (wing). Camberwell 92 games (1941, 1946-50). Camberwell 52 games (1946-49). Essendon 12 games (1940, 1944, 1946). Camberwell captain 1948. Fifth Liston Trophy 1948. Cleared to Brunswick Round 2, 1949. Camberwell 43 games (progress total 1947-49). Camberwell best and fairest 1948, 1949. Camberwell captain 1949. 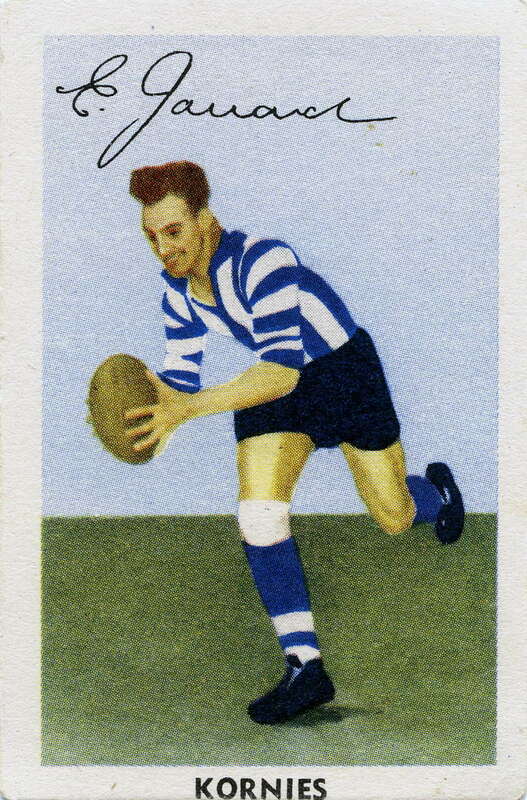 (Later 1950 Liston Trophy; appointed 1951 Camberwell captain coach). Recruited by North Melbourne from Fawkner. North Melbourne 66 games 17 goals (1937-41, 1945-46). Camberwell 61 games 150 goals (progress total 1947-49). Camberwell goals (39, 66, 45). Arguably Camberwell’s greatest-ever player. Captain Camberwell Team of the Century. Crossed to Camberwell 1947 from Hawthorn without clearance. Hawthorn 131 games 145 goals (1938-46). 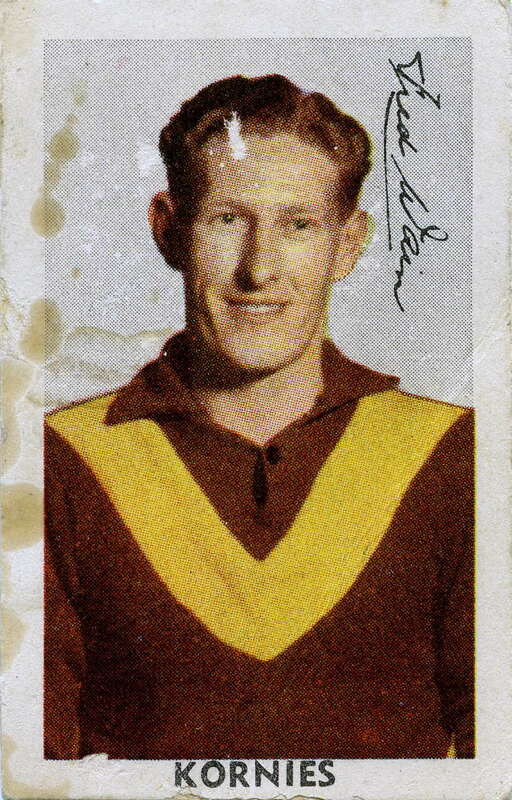 Hawthorn captain 1944-46. 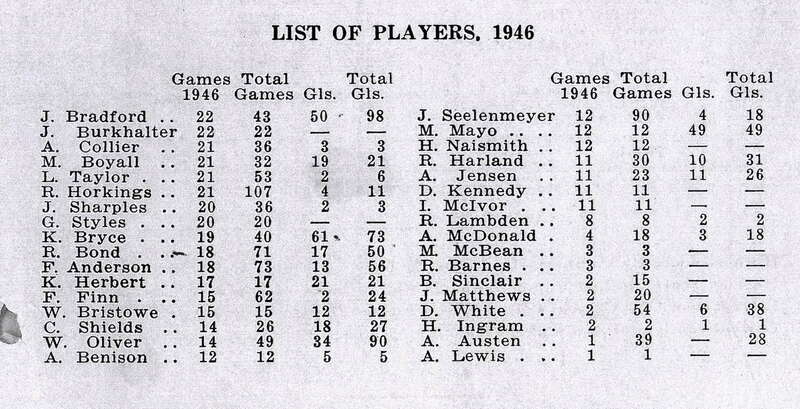 Hawthorn best and fairest 1943, 1945. 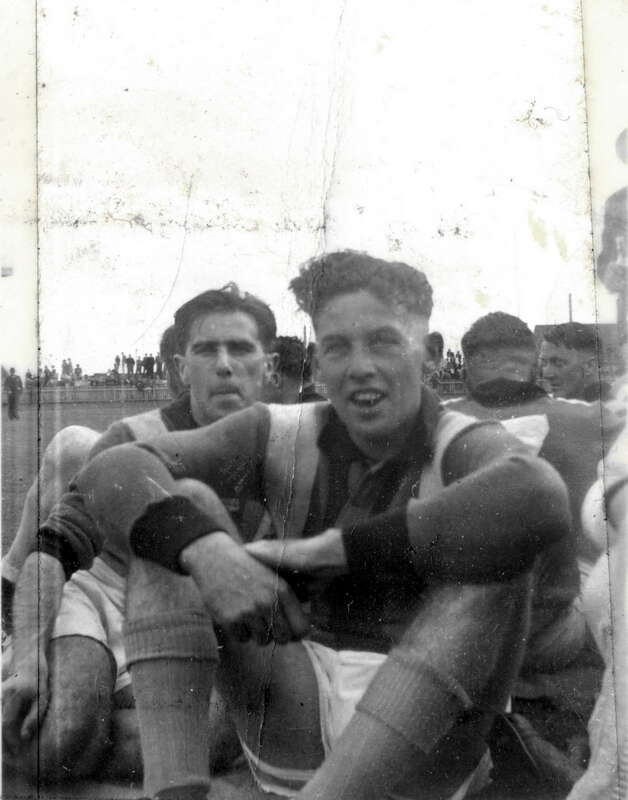 (Later Camberwell best and fairest 1951, 1952, 1953). Camberwell 73 games (1938-41, 1946). North Melbourne 8 games 5 goals (1942, 1944). Ex-Corowa. Camberwell 39 games (1941, 1945-46). Third Camberwell best and fairest 1945. Hawthorn 6 games 1 goal (1942). Ex-Kew (VFL Sub-districts competition). 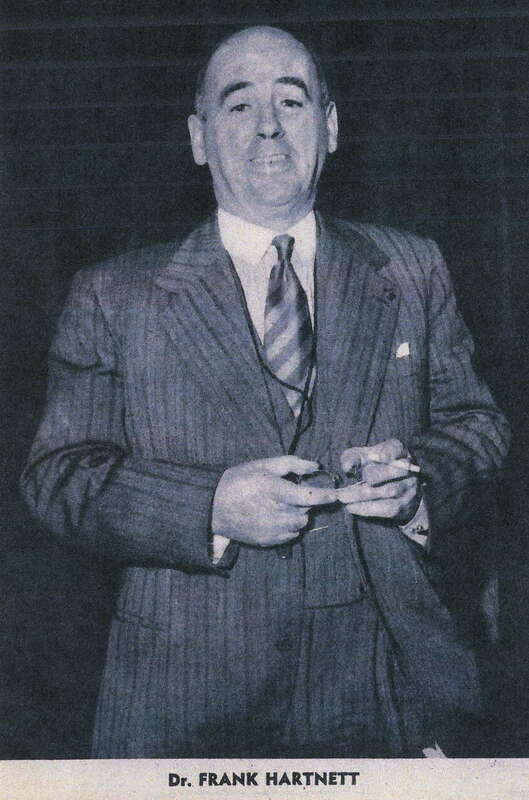 Brother of Col Austen (1949 Brownlow Medallist - Hawthorn). Camberwell 19 games (1946-48). 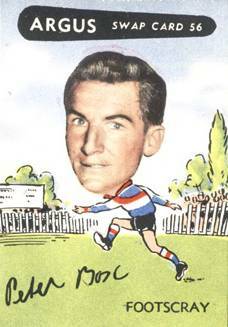 South Melbourne 42 games 32 goals (1939-44); Footscray 9 games 6 goals (1944). Ex-Richmond Seconds and Burnley. Camberwell 73 games (1938-41, 1946). 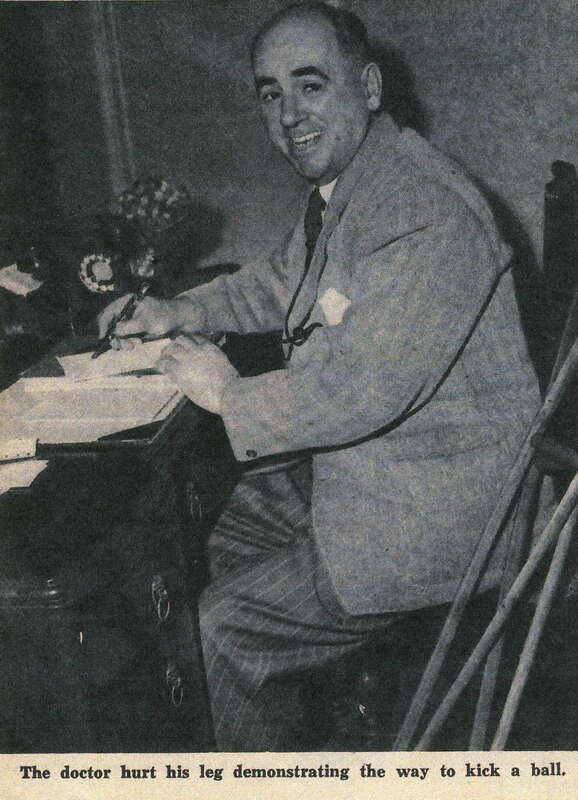 Camberwell FC Secretary 1951-54. Father of Graeme Bond (Richmond 1967-73, 1975-77; St.Kilda 1977-80; radio commentator). Camberwell 39 games (1946-48). Hawthorn 11 games 4 goals (1940-42). 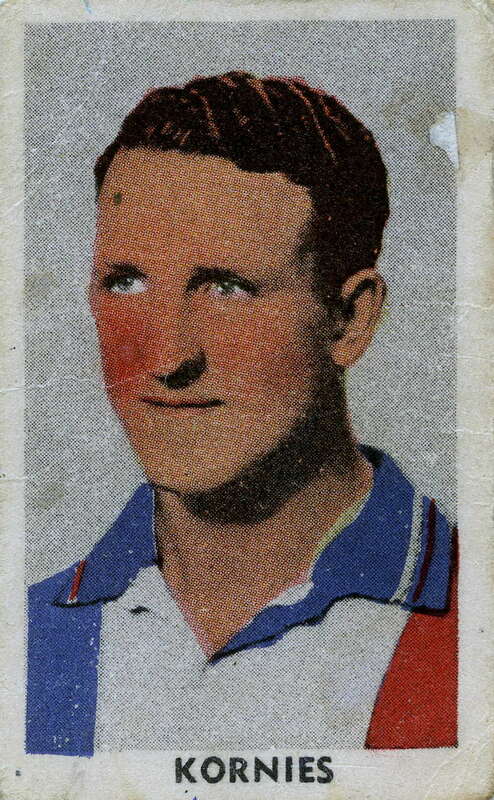 Fitzroy 18 games 14 goals (1944-45). Ex-Carnegie. Camberwell 55 games 100 goals (1945-47). Ex-Collingwood Seconds. Camberwell 55 games (1946-48, 1951). Ex-Glen Iris. Appointed Camberwell captain-coach 1945 but refused clearance by Essendon. Essendon 188 games (1939-49). Essendon best and fairest 1945. Camberwell 27 games (1945-47). Hawthorn 27 games 12 goals (1943-45). Ex-Glen Iris and East Malvern CYMS. 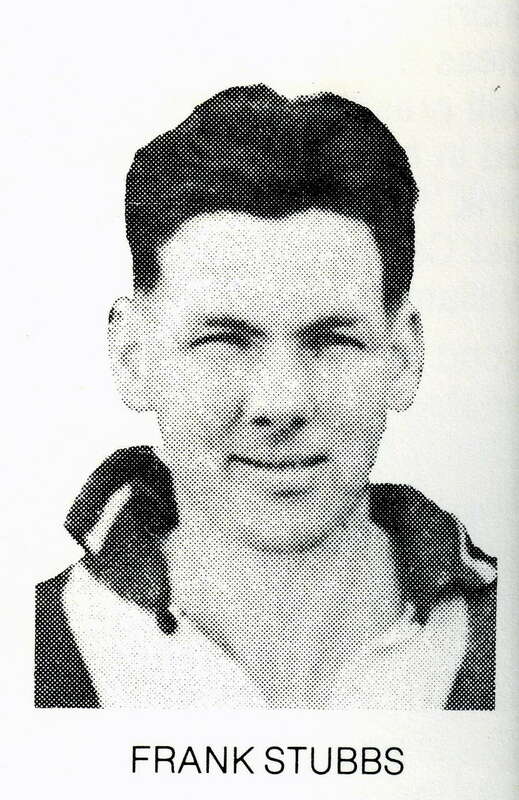 Replaced Marcus Boyall as Camberwell captain-coach 1947 (played twelve consecutive games at age of 39). 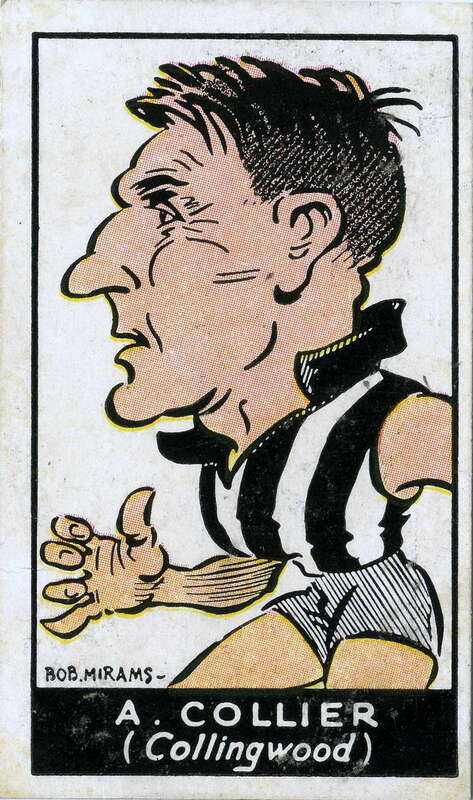 Collingwood 253 games 299 goals (1926-40). 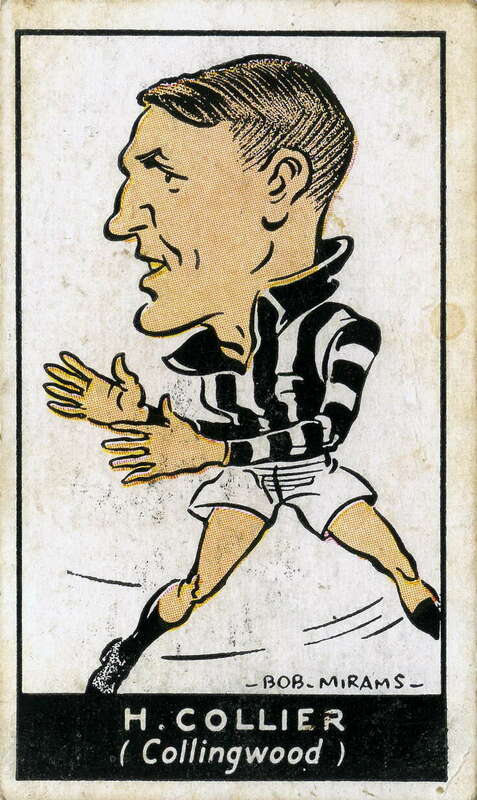 Collingwood captain 1935-39. 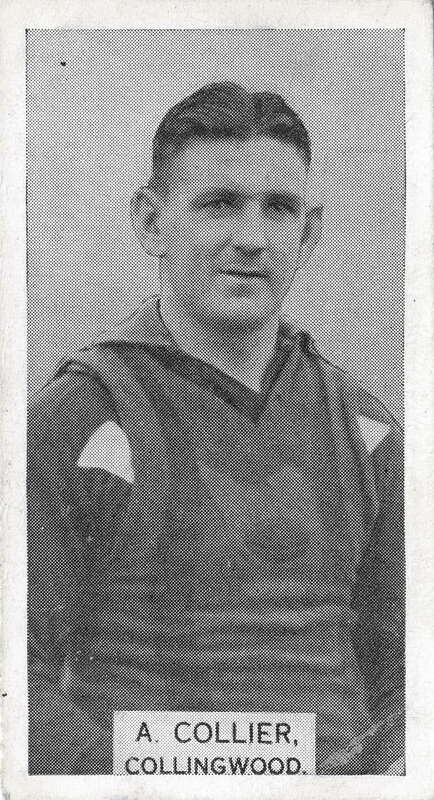 1930 Brownlow Medallist. Collingwood Team of the Century. Australian Football Hall of Fame. 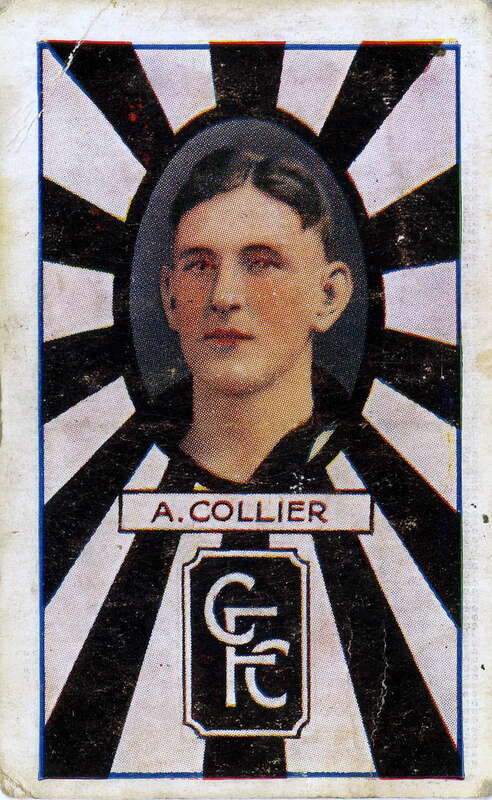 Brother of Albert Collier. Camberwell 11 games 24 goals 1945. 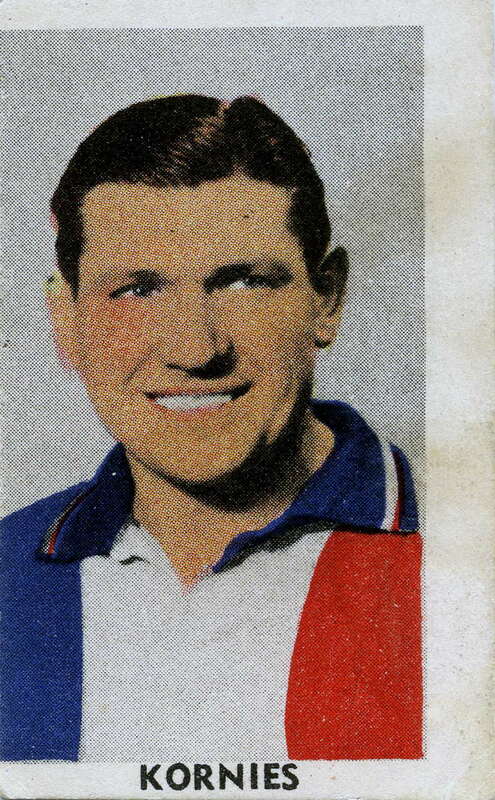 South Melbourne 47 games 50 goals (1939-41, 1944-45). Ex- Preston. Camberwell 2 games (1945). 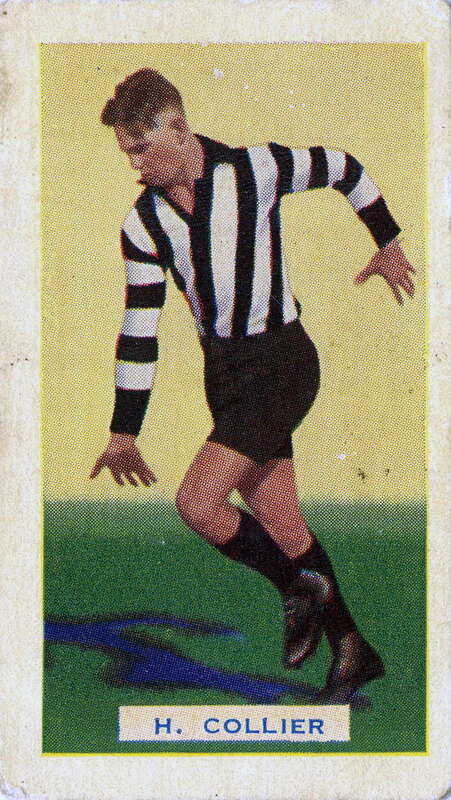 Collingwood 2 games 2 goals (1943-44). Camberwell 114 games (1949-56). Ex-Collingwood Seconds. Camberwell 3 games (1945). Hawthorn 9 games 4 goals (1939-42). Camberwell 62 games (1939-41, 1946). 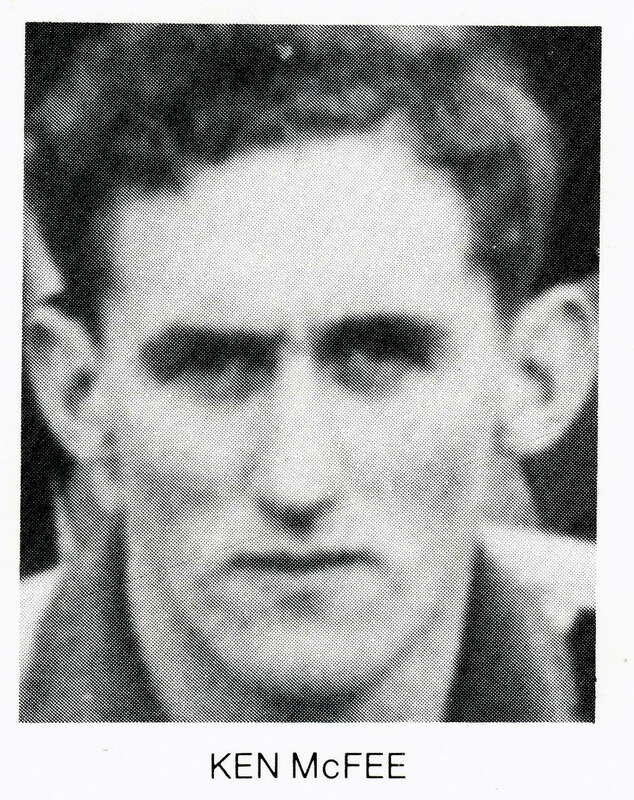 Aged 30 in 1946 so presumably not the same Frank Finn (born 1911) who played Carlton 4 games (1934); Footscray 3 games (1936-37). Camberwell 30 games (1945-46). Hawthorn 1 game (1944). Camberwell 83 games (1946-50). 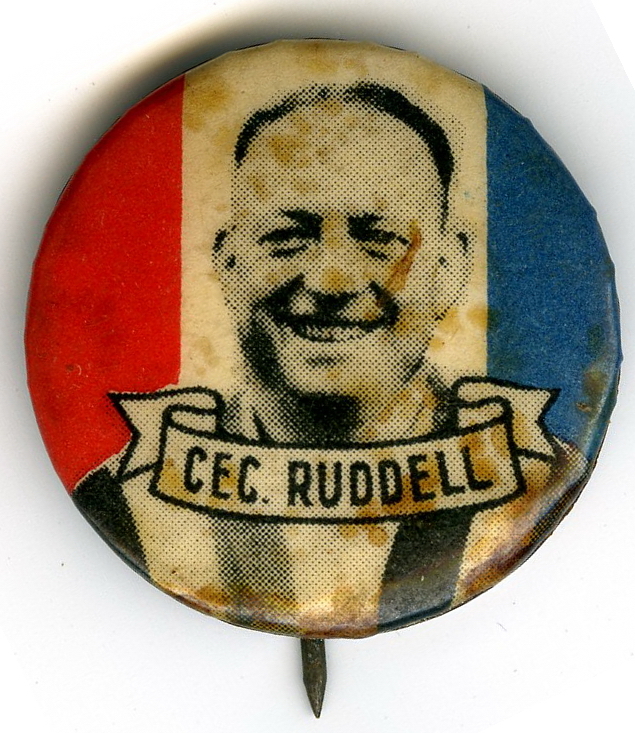 Collingwood 20 games (1942-45). Ex-Collingwood District. Camberwell 2 games (1949). Hawthorn 15 games 15 goals (1947-48). Camberwell 67 games (1945-50). Hawthorn 12 games 3 goals (1943-44). Camberwell 33 games (1941, 1945). Hawthorn 4 games 3 goals (1942). 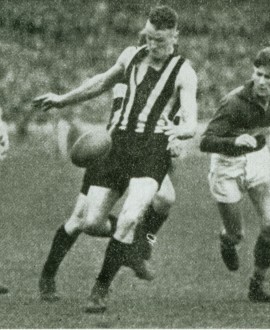 St.Kilda 4 games 1 goal (1943). Camberwell 72 games (1946-50). Footscray 17 games (1943-45). Ex-Braybrook. 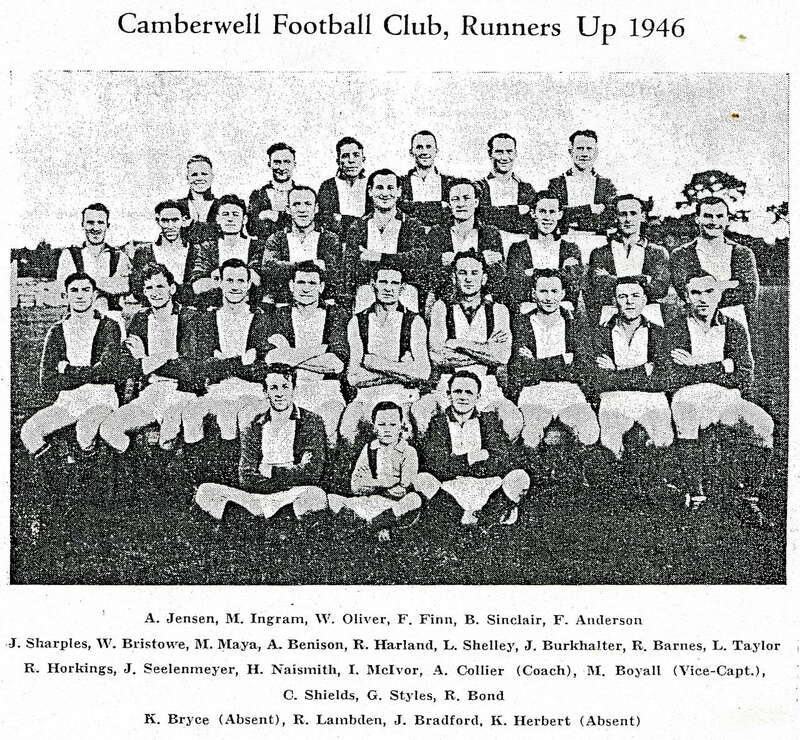 Camberwell 40 games (1949-54). VFA representative 1950 ANFC Carnival Brisbane. Camberwell 3 games (1946). 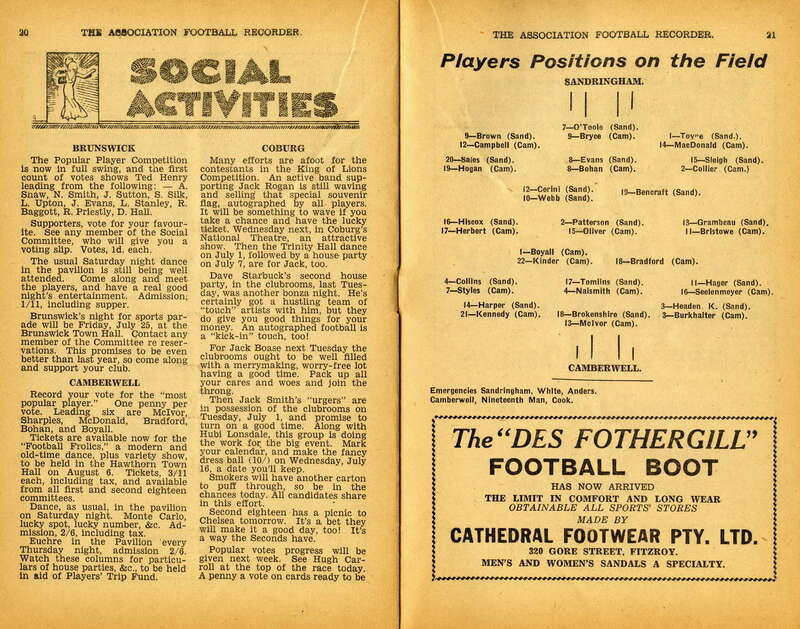 Footscray 4 games (1944-45). St.Kilda 55 games (1946-49). Ex-West Footscray. Camberwell 18 games (1945-46). Richmond 49 games 8 goals (1939-41, 1943). Starred on wing 1940 VFL Grand Final. Richmond VFL coach 1957-60. Ex-Leongatha. Camberwell 35 games (1945,1947-48). Camberwell 47 goals (1947); 31 goals (1948). Hawthorn 33 games 45 goals (1951-53). Camberwell 7 games (1948). Hawthorn 8 games (1946-47). 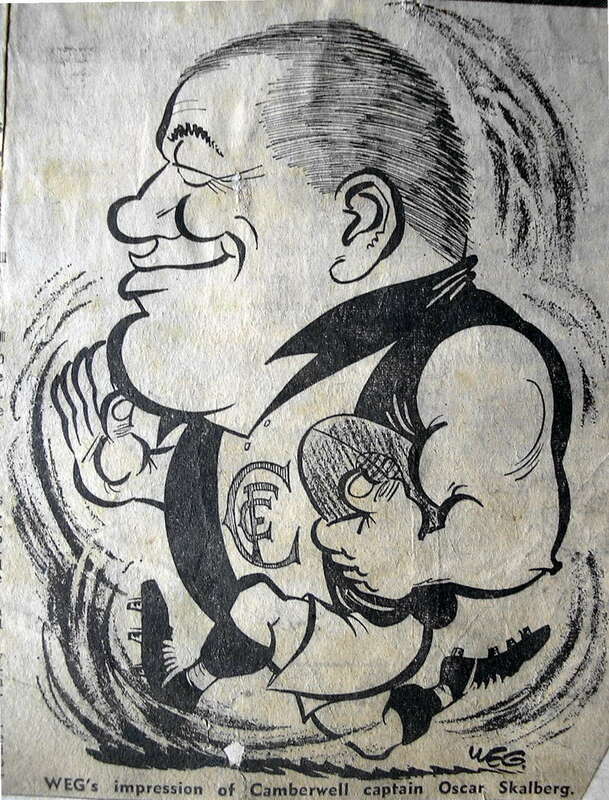 St.Kilda 12 games (1947). Later Captain of Burwood United Football Club. 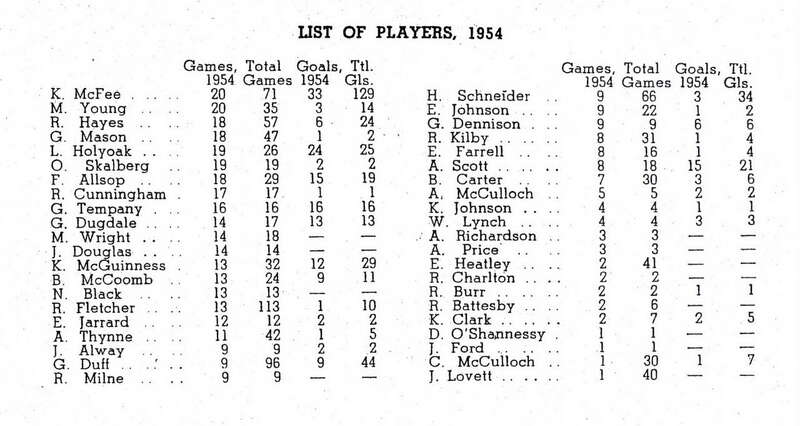 Camberwell 12 games 49 goals (1946). Ex-Glen Iris. Camberwell 61 games (1949-52). Camberwell 63 goals (1949). Hawthorn 10 games 15 goals (1948). Ex-Auburn. Camberwell 33 games (1946-47). 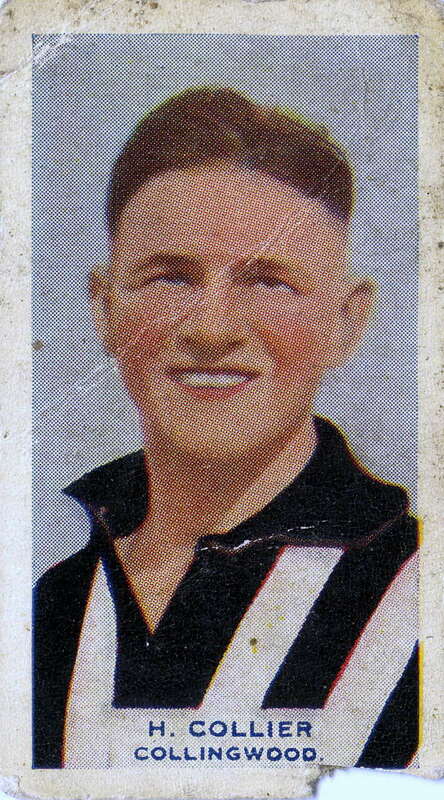 Collingwood 75 games 15 goals (1938-46) . Ex-Alphington Amateurs. Camberwell 75 games (1947-51). In the headlines after 1949 incident involving Port ruckman Reg Murray (Murray suspended 14 weeks). 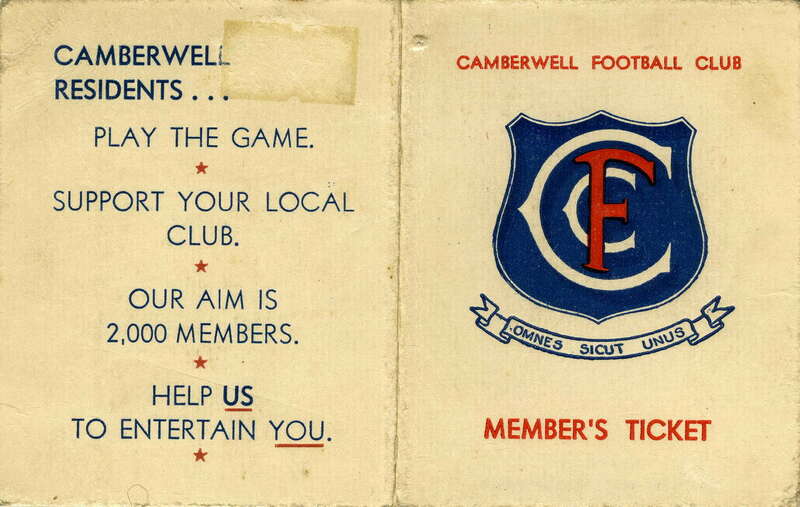 Camberwell 109 games (1937-41, 1945-48). Ex-Auburn. 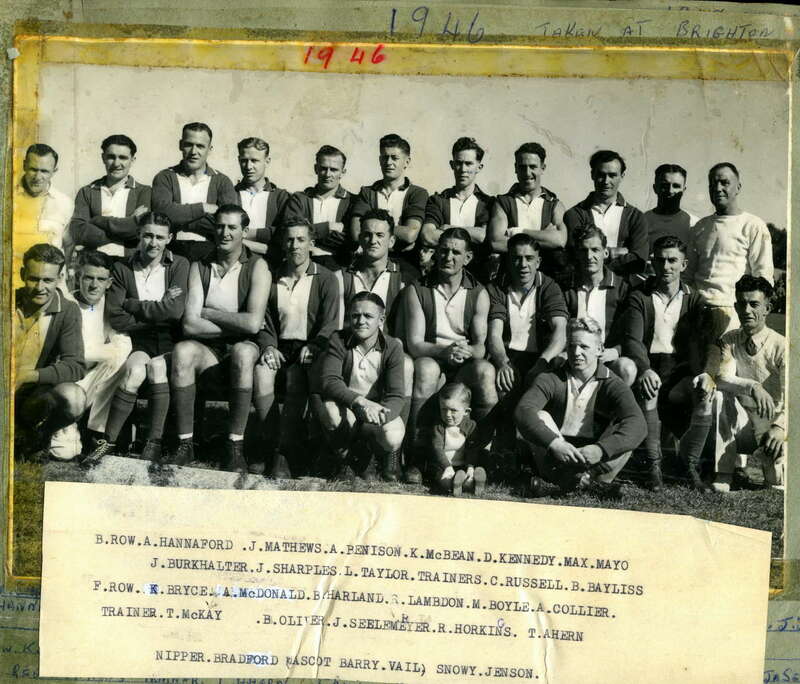 Norwood FC (SANFL) 1941. Served RAAF 457 (Spitfire) Squadron in World War Two. (See www.spitfireassociation.com.au/peacock-kenneth-2/ ). Camberwell Cricket Club Team of the Century. Camberwell 26 games (1945-46). 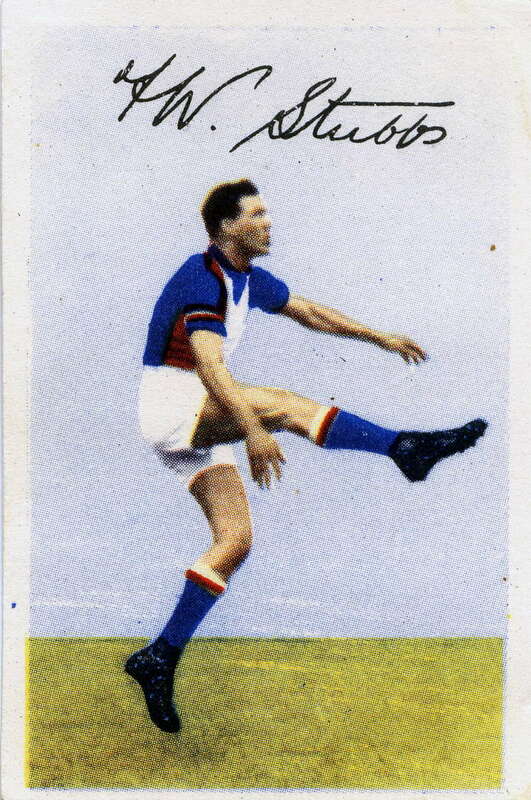 Footscray 13 games 8 goals (1935-37). Collingwood 7 games (1938-39). 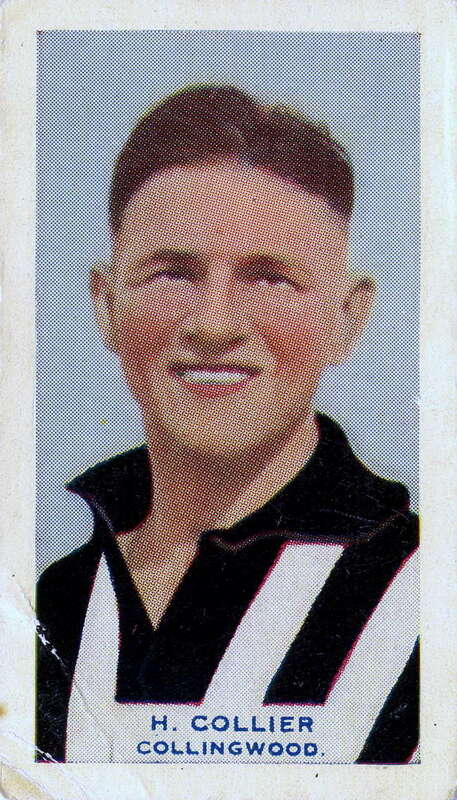 St.Kilda 26 games 5 goals (1941-43). Camberwell 75 games (1946-50). Richmond 16 games (1942-43, 1945). Ex-Croydon. Camberwell 66 games (1941, 1945-47). Second Camberwell best and fairest 1945. 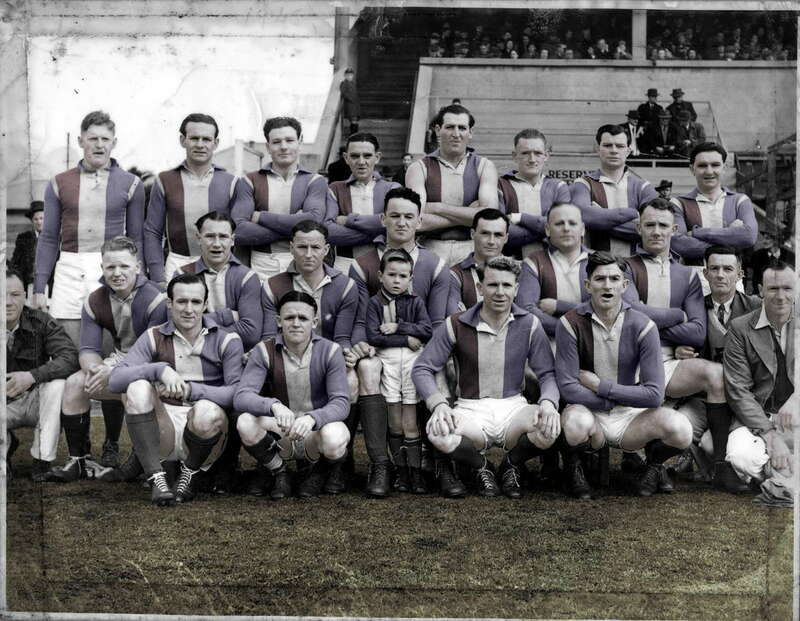 South Melbourne 4 games (1937-38). 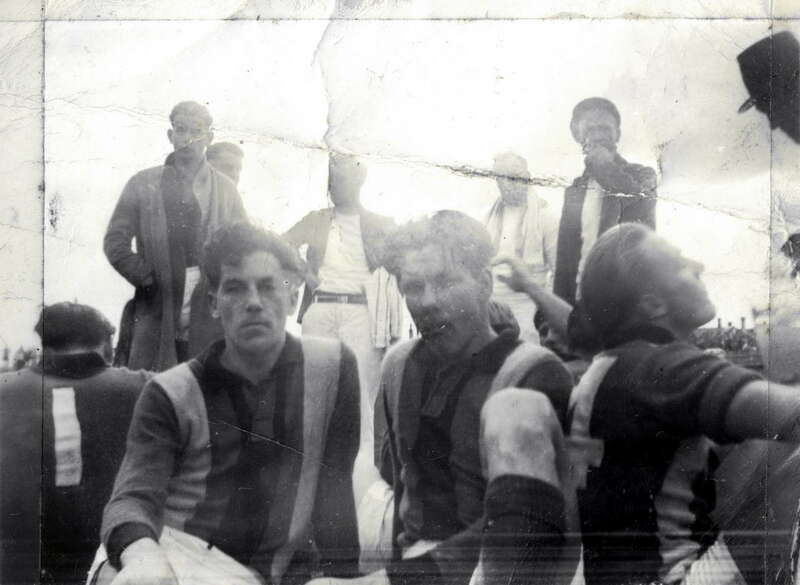 St.Kilda I game (1940). Hawthorn 40 games (1942-44). Ex-Prahran Churches. Camberwell 55 games (1948-52). VFA representative 1950 ANFC Carnival Brisbane. VFA attendances dropped significantly in 1950, heralding a gradual but definite decline in interest over the next twenty years. Camberwell’s fortunes in the fifties traced a similar pattern. From being strong and competitive in the forties, the club’s performances both on field and off slumped downwards, culminating in the catastrophic year of 1959. Looking back at the fifties, Marc Fiddian wrote that even in 1950 Camberwell was 'no longer a force'. It was not immediately obvious the Wells were on a slope however. In 1950 they were twice thrashed by Brighton but almost beat Williamstown at Williamstown and defeated Port Melbourne at Port. 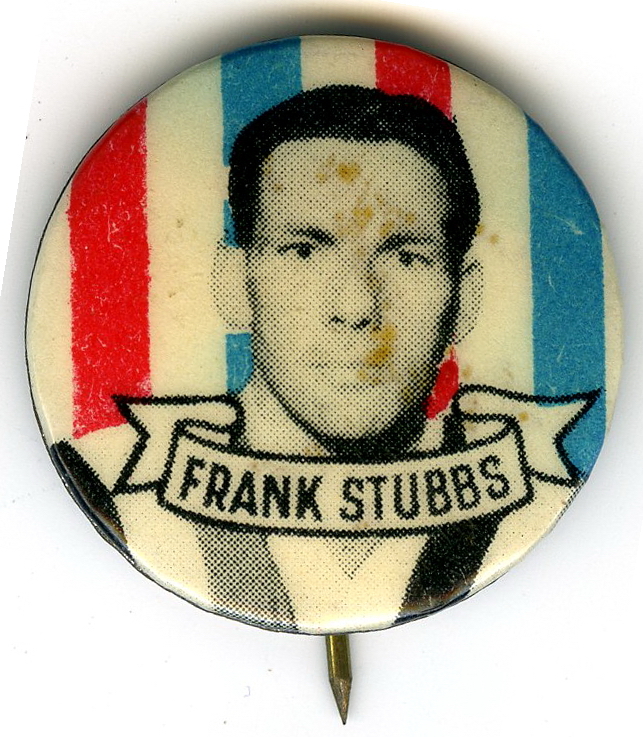 19 Certainly ‘1951’ was the club’s worst season for twenty years, with big losses to Coburg and Williamstown, and the instability created by the ‘Frank Stubbs Affair’ (see below – ‘Stars of the Fifties’), but in 1952 the team performed admirably, even defeating Williamstown at home by 63 points in Round 13. In Rounds 17 and 18 the Wells defeated eventual premiers Oakleigh (at Oakleigh) and Box Hill to move to third place. Alas, the last two games were lost and the Wells finished sixth. The improvement may have suggested ‘1951’ was an aberration. In fact time was to prove ‘1952’ was the aberration in what became a depressing decade for the Wells. Camberwell finished near the bottom in 1953, 1954 and 1955. In 1954 the Wells defeated only the bottom team (Sandringham). 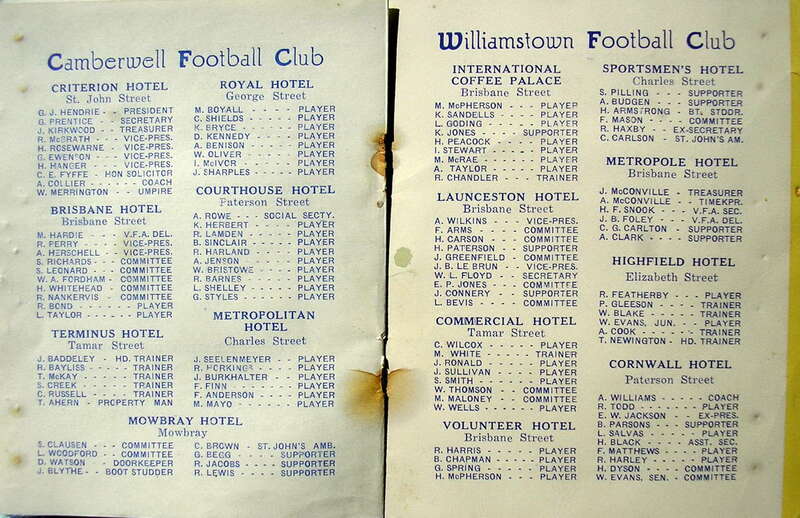 Camberwell regularly suffered big losses to both Williamstown and Port Melbourne in this period, and although tight games in 1955 against these adversaries were seen as positive omens, things returned to ‘normal’ in 1956 when the team twice lost badly to the Seagulls (76 points and 63 points) – and also lost the last eight games. An improved performance in 1957 – when the Wells scored good wins against Northcote and Oakleigh and ran Port close at Camberwell in Round 17 - might have suggested an upswing, particularly as it was followed by an extremely impressive start to the 1958 season. There were others factors at play in the poor finish to the 1958 season. 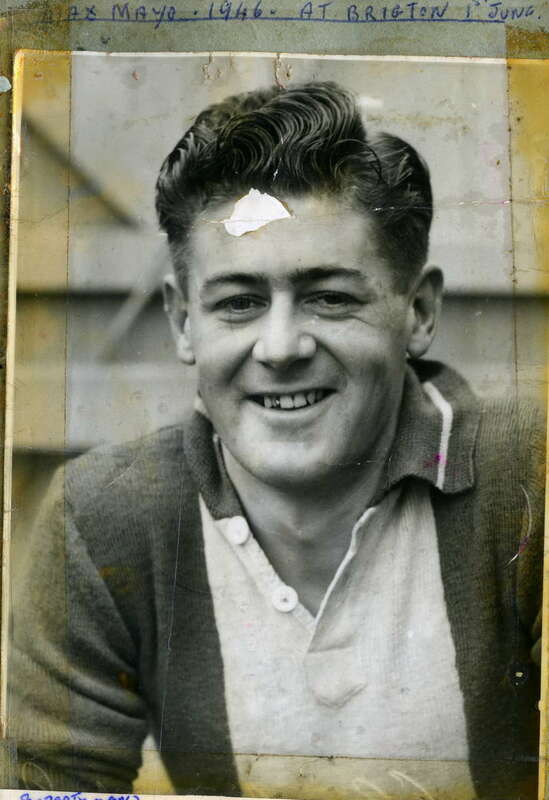 Star centre player Lloyd Holyoak, unable to abide Ken Ross, left Camberwell to coach Kilsyth (starting 1958 season). He had been Camberwell’s best player in the previous three seasons (1955-57), and the team no doubt missed his drive. 21 Also, it seems the 1958 Centenary Carnival was costly to the club, leaving VFA captain Ross exhausted, Peter Box injured, and the finances depleted. 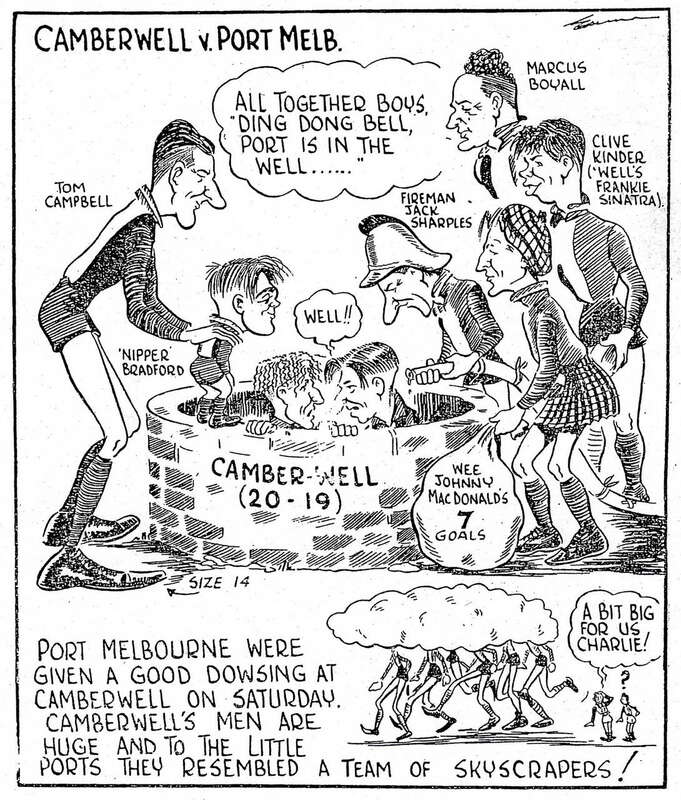 22 In 1959, without Ross and Box, and having cleared a total of fourteen players, Camberwell hit rock bottom, winning one game (Brighton, Round 13) and the wooden spoon. There were some pitiful and embarrassing results - scores of 2.7, 2.4 and 1.8; eight defeats of more than 100 points; two 90-point defeats. During the season the percentage dropped below 30% but picked up slightly to finish at 39.1%. Off-field troubles plagued the administration throughout the fifties. Before the start of the 1955 season Hakoah Soccer Club applied to use Camberwell Oval on alternate Saturdays and the VFA club was threatened with the loss of its ground. 23 On top of all that, the Wells, after sacking 1954 coach Ted Jarrard, struggled to find a coach for 1955. After fifteen attempts they eventually settled on committee man and selector Roy Laing, coach in 1937 and 1938. 24 The 1959 season began with ructions over the clearance of rover Brian Coleman (49 games) to Hawthorn. President Hartnett took umbrage at the decision of the Committee to clear Coleman and resigned. Clearly, even before this, frustration had been building in Hartnett. ‘I make my exit from the frustrated fields of local football ambition’ he wrote in his addendum to the 1958 Annual Report, and lashed out savagely at Camberwell Council for its ‘pusillanimous recognition’. For my own personal reflections on Camberwell social (and football) life in the 1950's, I refer the reader to two relevant memoir articles on this website - 'The Footy Swap Cards that never got Swapped' and 'Statistician Extraordinaire - Eat your heart out Ted Hopkins'. 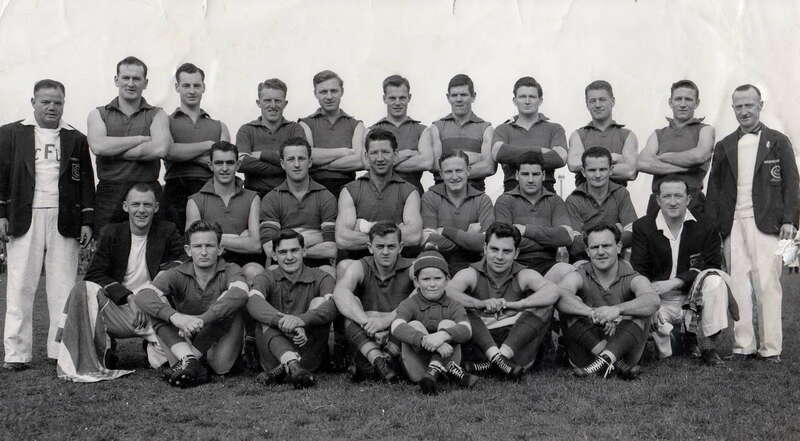 Top row – left to right: Ron McCurdy (1956-7, 7), Graeme Tempany (1954-57, 64), Peter Bell (1956-58, 35), Ken Chambers (1957-61, 58), Geoff Mason (1952-61, 127), Eric Chaplin (1957-61, 60), Brian Hegarty (1957, 18), Oscar Skalberg (1954-62, 151), Kevin Johnson (1954-62, 116). 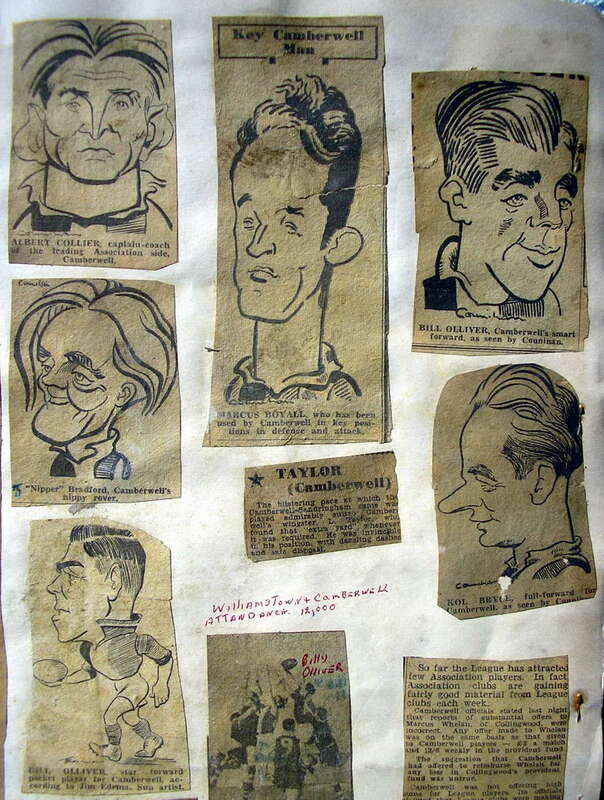 Middle row – left to right: Ted Higson (1957-59, 38), Lloyd Holyoak (1953-57, 82), Ken Ross (1956-58, 55), Keith McGuinness (1953-60, 105), Les Amery (1957-58, 30), George Dugdale (1953-57, 48). 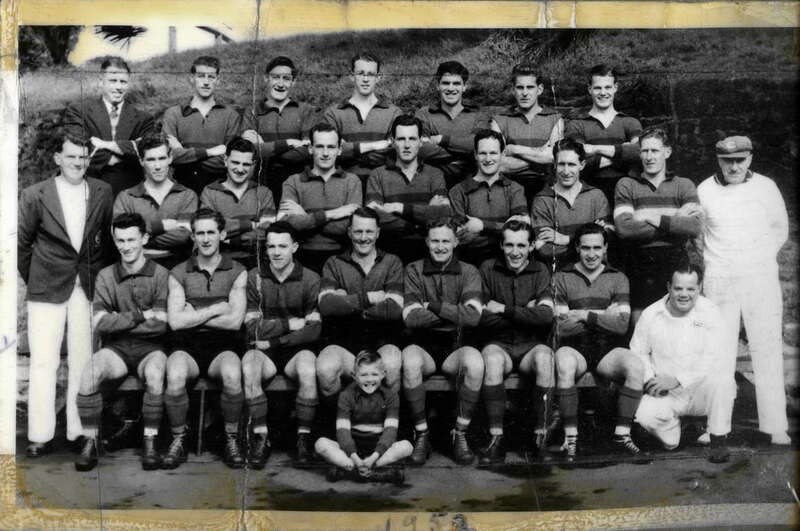 Front row – left to right: (unidentified player - possibly Jim Alway), David McPhail (1957, 6), Bruce Seymour (1955-59, 48), Brian Coleman (1956-58, 49), Norm Watts (1956-60, 48). First year players: Chambers, Chaplin, Hegarty, Higson, Amery, McPhail. Round 14, July 26, 1952 - lost to Coburg at Camberwell - 3.3 to 12.18 (only goal kickers – Bradley, McFee, Thynne). 19/20 - J.Connell L. Marian. 20 - J.Allan (42), D.Bedford (35), K.Benbow (76), J.Bohan (120), R.Callahan (28), R.Fletcher (82), L.Marian (30), K.McFee (31). 19 – R.Bradley (19), R.Hayes (19). 12 – J.Connell (12), A.Thynne (12), D.Waters (12). 10 – G.Mason (10), R.Heatley (36). 8 – G.Harriot (8), M.Young (8). 5 - J.Bendle (5), N.Unstead (5). 4 – W.Cook (4), R.Milgate (4), H.Schneider (4). 3 – D.Downes (3), J.Lovett (3), K.Taylor (3). 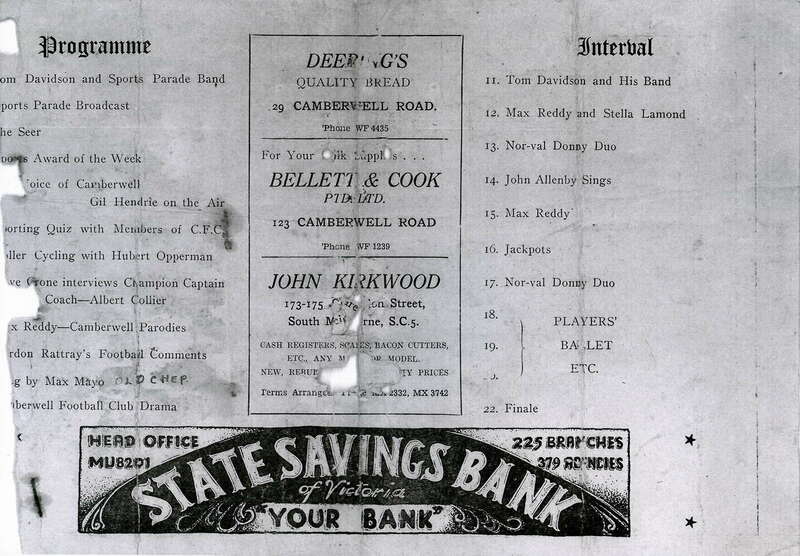 Camberwell 1953 final list (The Argus, Wednesday, April 15, p. 11). OLD - J.Bohan, R.Callahan, D.Waters, J.Allan, R.Fletcher, G.Mason, R.Bradley, J.Connell, R.Kilby, A.Thynne, R.Heatley, L.Marian, M.Young, E.Farrell, K.Benbow, G.Duff, J.Little, R.Hayes, F.Rosenbrock, J.Hedley, K.McFee, H.Schneider. NEW – W.Nicholson, M.Wright, L.Holyoak, B.Lithgow, F.Wain, F.Allsop, R.Burchill, A.Scott, D.Donaldson, K.Clark, E.Johnson, P.Walsh. SUPPLEMENTARY – A.Welch, A.Picton, D.Evans, R.Brown, R.Battersby, J.Kavanagh, E.Pratt. Camberwell 1954 Final List (The Argus, Wednesday, April 14, 1954) (possible mistakes/typographical errors). OLD – Ted Jarrard, Gordon Duff, Alan Thynne, K.Clark, R.Battersby, Ted Farrell, Fred Milne, Alan Scott, R.Burr, K.Coleman, Reg Fletcher, Lloyd Holyoak, Ken McFee, Fred Allsop, Robert Hayes, Bob Kilby, Geoff Mason, Maurie Young, Keith McGuinness, Norm Black, Barry McCombe, Harry Schneider, D.Evans, W.Nicholson, Ted Heatley, S.Burr, Radin, Aitken, George Dugdale, Ted Johnson, Ron Allsop, A. McCulloch, Hourigan, Brian Carter, Muir Wright, K.Battersby, R.Burchall, Jim Alway. Subject to clearance – Ron Cunningham, Splatt, R.Coker, William Lynch, G.Dennison, O’Shannessy, McCoubrie, Robert Charlton. OFF – Jim Bohan (retired), Bob Bradley (retired), Fred Wain (cleared). May 1, 1954 – Round 3 v Northcote at Northcote – lost 9.11 to 13.6 (Alan Scott kicked five goals). May 8, 1954 – Round 4 v Sandringham at Camberwell – won 10.16 to 9.12. June 12, 1954 – Round 9 v Yarraville at Yarraville – lost 12.9 to 13.8. 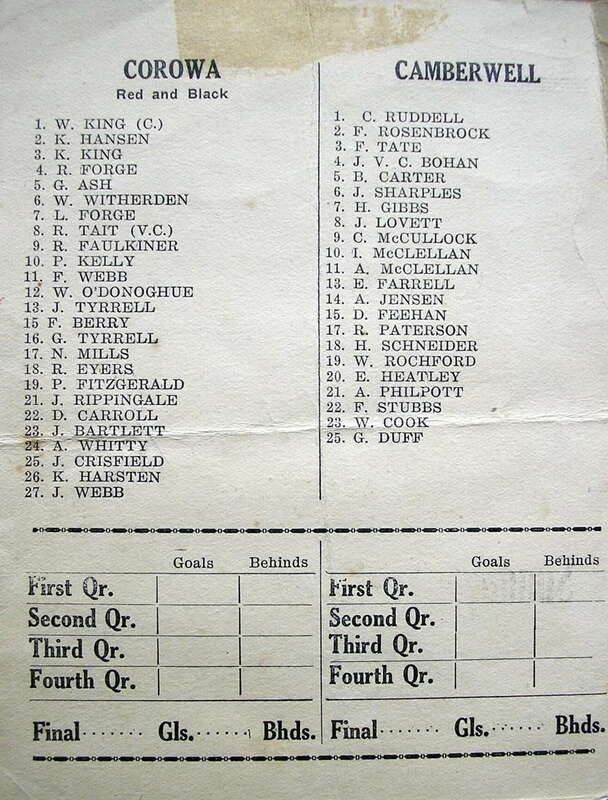 July 3, 1954 – Round 12 v Coburg at Camberwell – lost 7.8 to 10.9. 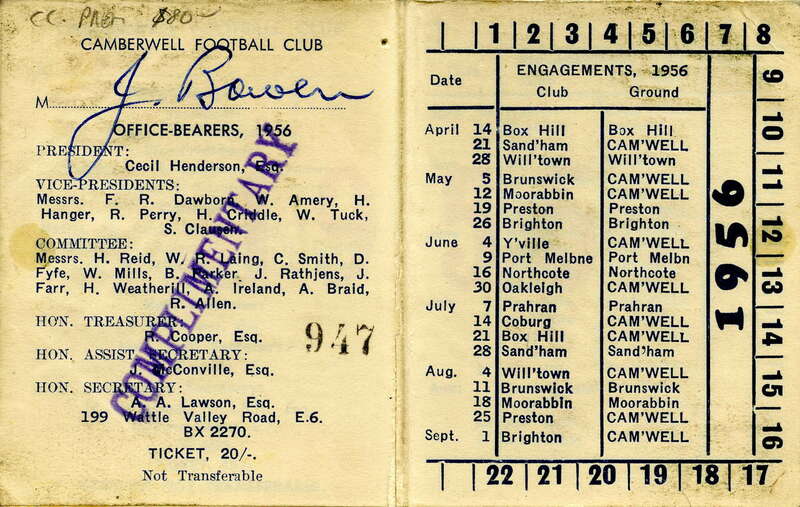 August 14, 1954 – Round 17 v Prahran at Camberwell – lost 10.17 to 17.8. 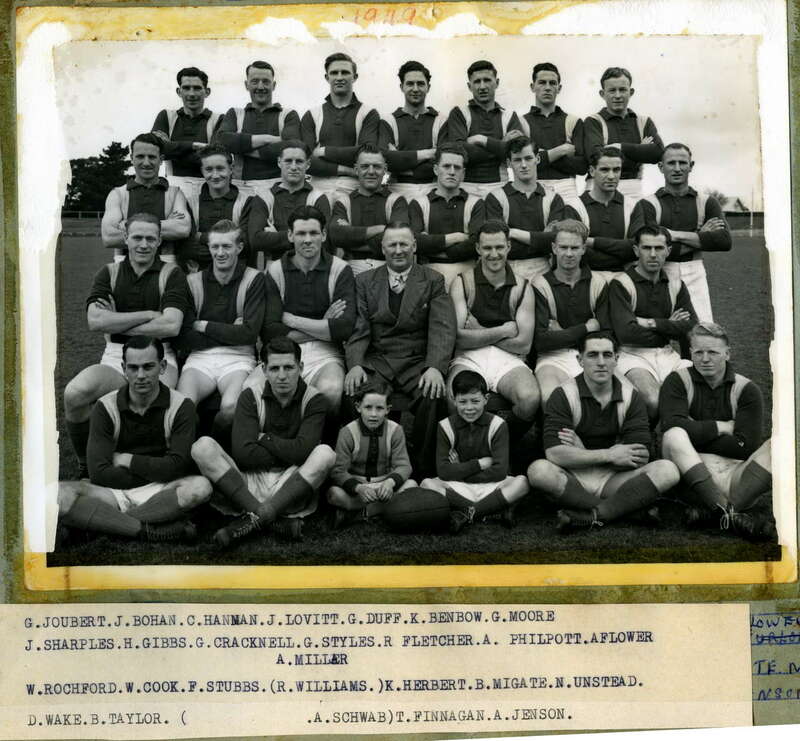 August 21, 1954 – Round 18 v Oakleigh at Oakleigh – lost 9.12 to 16.13. September 4, 1954 – Round 20 v Port Melbourne at Port Melbourne – lost 9.9 to 22.23. 9 – J.Alway, G.Duff, E..Johnson, F.Milne, H.Schneider, G.Dennison. 8 – R.Kilby, E.Farrell, A.Scott. P.Deagan – 1, R.Hayes – 2, L.Holyoak – 3, J.Hedley – 4, F. Allsop – 5, J.Lane – 6, F.Milne – 8, P.Heil – 9, K.Benbow – 10, G.Tempany – 11, G.Dugdale – 12, E.Johnson – 13, G.Duff – 14, L.West – 15, K.McKaige – 16, J.Alway – 17, M.Young – 18, K.Johnson – 19, K.McGuinness – 20, L.Turnbull – 21, K.Clarke – 22, G.Mason – 23, O.Skalberg – 24, B.Seymour – 25, R.Kilby – 26, H.Schneider – 27, M.Wright – 28, R.Cooke – 29, A.Price – 30, E.Farrell – 31. 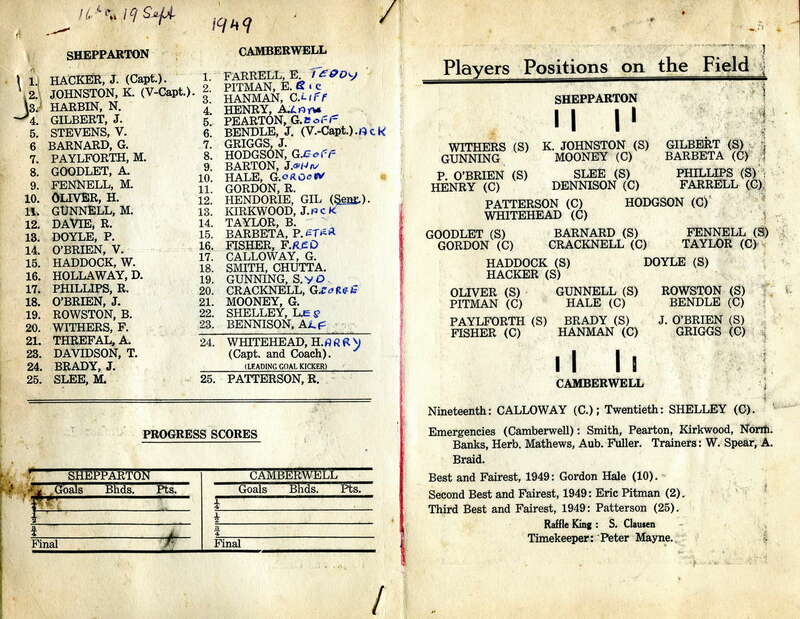 May 14, 1955 – Round 5 v Sandringham at Camberwell - lost 12.9-17.20. OLD - K.Ross, P.Bell, K.Chambers, K.Johnson, E.Chaplin, B.Seymour, L.Amery, K.McGuinness, G.Mason, E.Higson, B.Coleman, I.Skalberg, N.Watts, R.Castles, F.Batey, C.Douglas, G.Hambrook, B.Madden, A.Moran, S.Lanning. NEW - P.Box, R.Fletcher, G.McIsaac. SUPPLEMENTARY - R.Allsop, H.Schneider, V.Sabbatucci, M.Commons, A.Moule, J.Stenberg, D.McPhail, A.Schwab. SUBJECT TO CLEARANCE - B.Johnson, R.Brown, I.Whitten, B.McKechnie, D.Clarke, J.Leach, B.Bennie, R.Veale. Res: K.Johnson, B.Madden; Emerg: S.Lanning, R.Castles. Arguably Camberwell’s greatest-ever player and comparable to Laurie Nash in his ability to dominate games. Played a further 79 games (and kicked a further 64 goals playing mainly at full-back) for the Wells in fifties (to finish on 140 games overall). Took over captain-coach role from Stubbs mid-season 1951 (see below) and continued in role 1951-53. Camberwell best and fairest 1951, 1952, 1953. 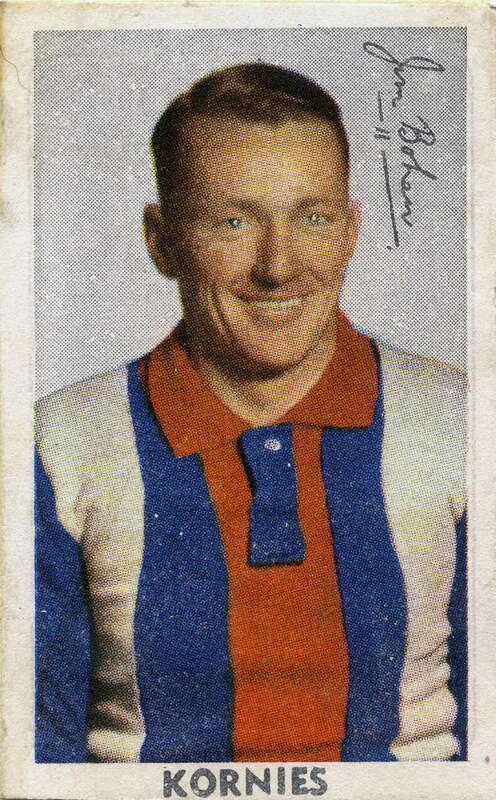 Close second 1952 Liston Trophy (45 votes – Frank Johnson Port Melbourne 47). Captain/full back Camberwell Team of the Century. Camberwell captain 1949. 1951. 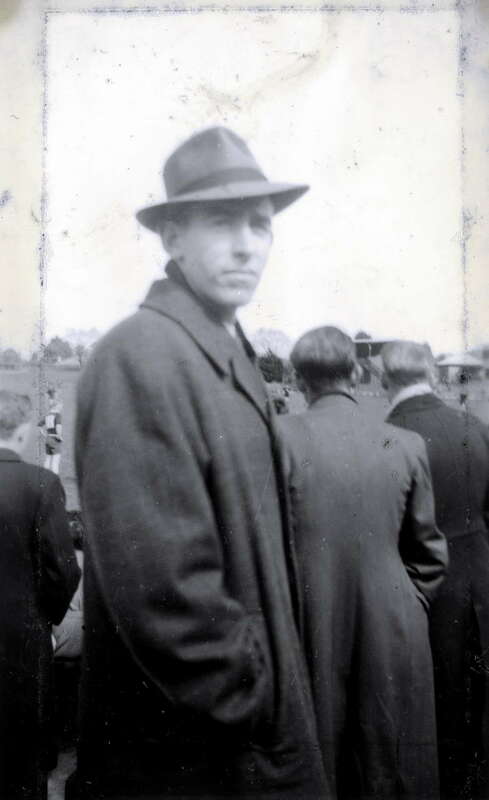 The champion ruckman lost the captaincy/coaching position in 1951 (after 13 Rounds) when teaching job at Monbulk interfered with his role at Bowen Street. Played only a further 27 games for Camberwell in fifties (to finish on 70 games). Camberwell best and fairest 1948, 1949, 1950. Won 1950 Liston Trophy. Ruckman in Camberwell Team of the Century. Ex-Collingwood Seconds. Ruckman/defender, renowned team player. Camberwell 110 games. Third Camberwell best and fairest 1953. VFA representative ANFC Carnival 1953. Playing coach of Camberwell Seconds 1963-65 (including 1963 premiership). Assistant coach Camberwell seniors 1979-86. Ruckman Camberwell Team of the Century. Ex-Sandringham. Goalkicking rover. Camberwell 73 games 131 goals (20, 41, 35, 33, 2). Second Camberwell best and fairest 1953. 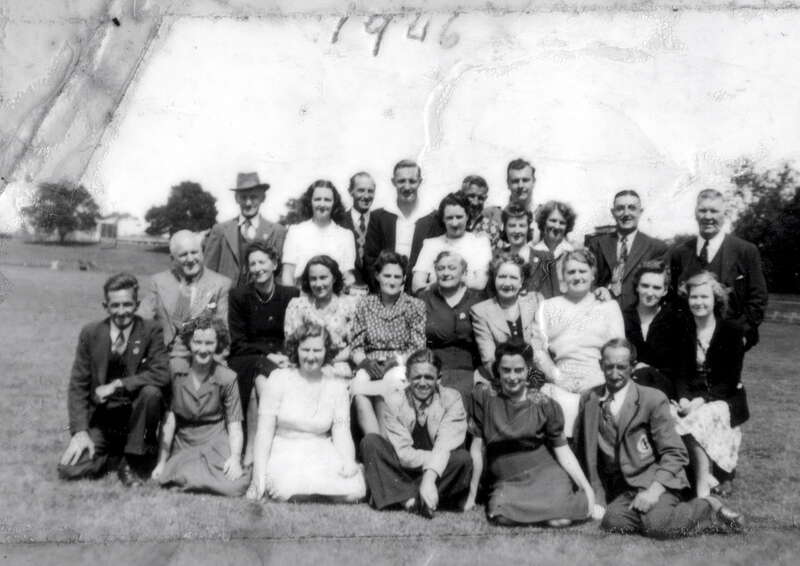 VFA representative ANFC Carnival 1953. Cleared to Brunswick after three rounds 1955. 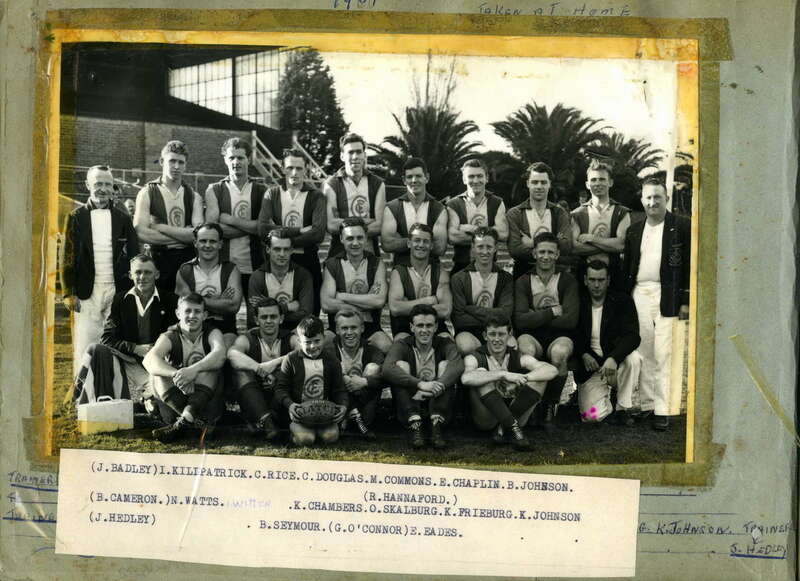 Ex-Malvern Amateurs; ex-Melbourne (4 games 1951). Solid and reliable defender. Camberwell 127 games. Camberwell best and fairest 1954. Camberwell Team of the Century (Centre Half Back). Missed 1959 and 1960 seasons. South Melbourne 2 games 1961. Ex-Richmond Seconds. Fast and flashy wingman and half-forward. Camberwell 105 games. 144 goals (1953-58 - 17, 12, 17, 38, 32, 28). Second Camberwell best and fairest 1956. VFA representative ANFC Carnival Perth 1960. Missed 1959 season. Back pocket. Camberwell 116 games. Camberwell best and fairest 1959. Included here as ‘star’ for sheer guts and determination alone. Mid-way through 1957 season - badly smashed breastbone. 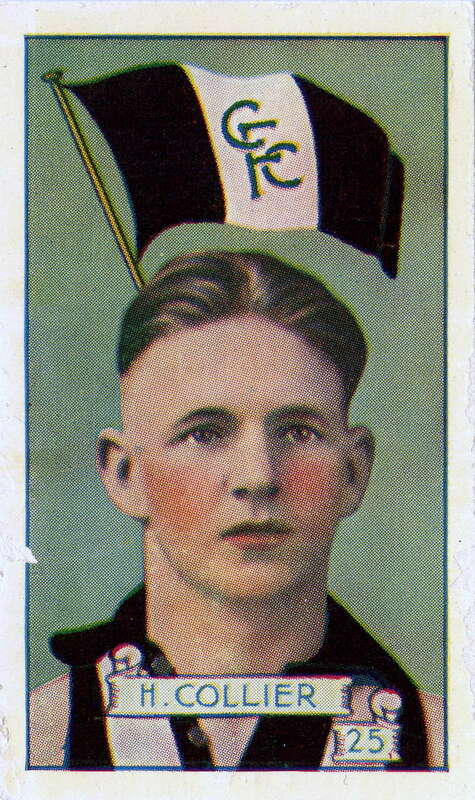 Played last three matches season 1957 – three months later work accident (right eye pierced by nail – damage to lens and his sight). Start of 1958 season prepared for a comeback (kept damaged eye shut while playing). Chosen for senior team Round 5, 1958. Ex-Northcote. 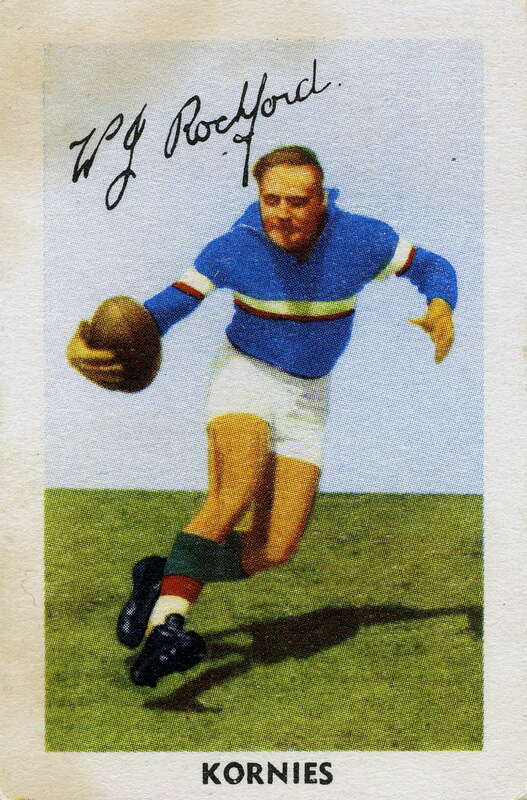 Ex-Fitzroy (129 games 1948-55, 1959-60). Camberwell 55 games 1956-58. Camberwell captain-coach 1956-58. Camberwell best and fairest 1956-57. Won Liston Trophy 1957. Second Liston Trophy 1956. Fourth Liston Trophy 1958. Captain VFA team 1958 ANFC Carnival. Back pocket Camberwell Team of the Century. Ex-Fitzroy Seconds. Ex-Northcote. Essendon 122 games (1940-49 – including premierships 1942, 1946). Camberwell captain-coach 1950 (8 games). North Melbourne 130 games (1944-53). North Melbourne Team of the Century. 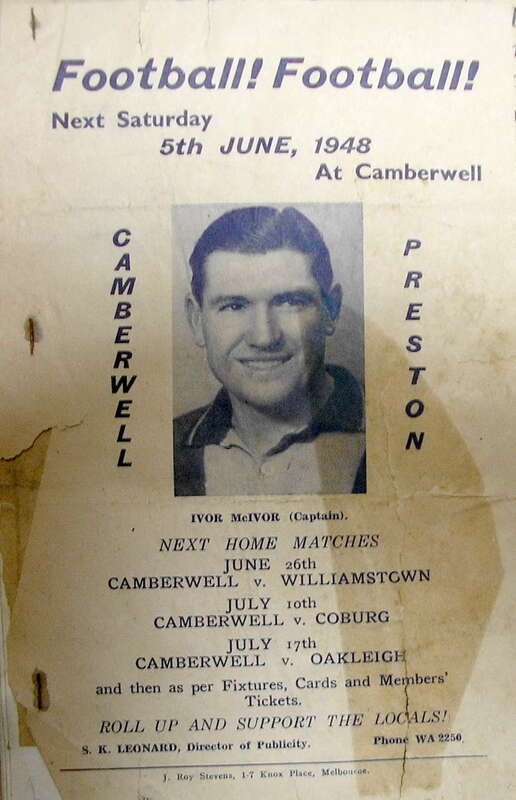 Camberwell captain-coach 1954 (12 games). Ex-Auburn. Hawthorn 10 games 15 goals (1948). Camberwell 61 games (1949-52). Camberwell 171 goals (63, 35, 69, 4). VFA representative 1950 ANFC Carnival Brisbane. Ex-Cheltenham. 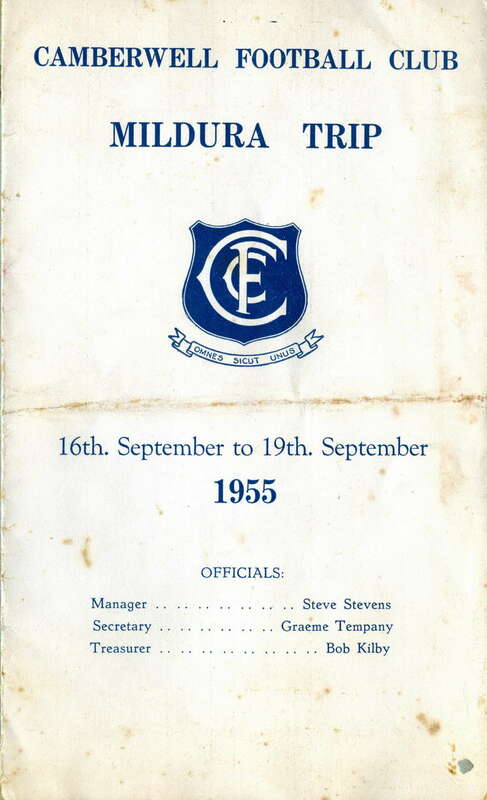 Footscray 107 games (1951-57). Brownlow Medal 1956. Camberwell 18 games (1958). VFA representative 1958 ANFC Carnival. Camberwell best and fairest 1958. North Melbourne 9 games (1951-52). Moorabbin (1953). 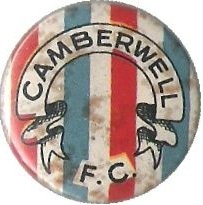 Camberwell 151 games (1954-62). Camberwell captain 1960-62. Collingwood 18 games (1953-54). Camberwell 36 games (1955-56). Camberwell captain 1955/vice-captain 1956. 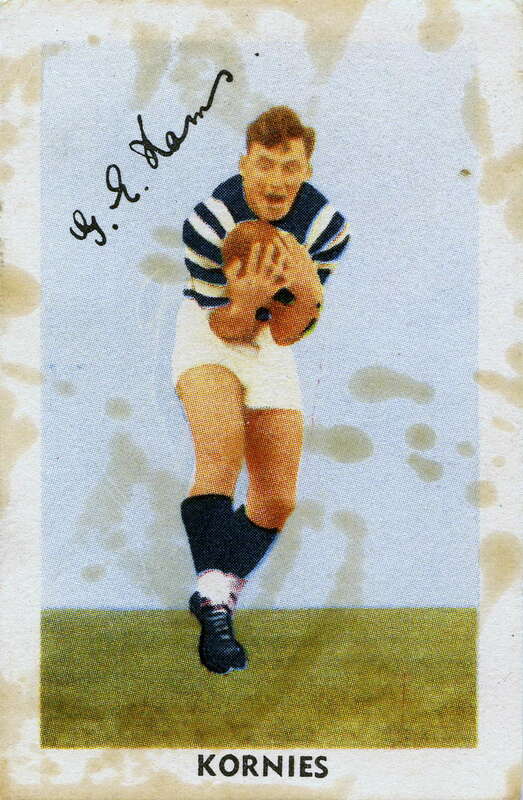 South Melbourne 48 games (1951-54). Camberwell 15 games (1955). Camberwell captain 1955. Carlton 15 games (1949-51). Camberwell 42 games (1952-54). Hawthorn 55 games (1949-53). Camberwell 13 games (1954). North Melbourne 31 games (1948-50). 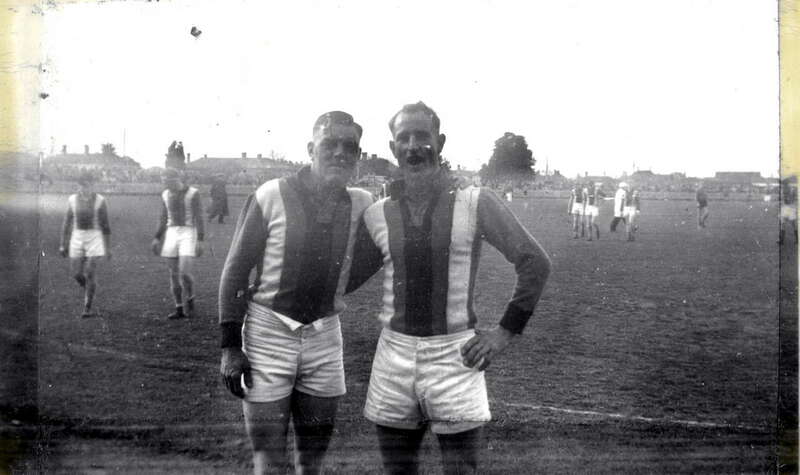 South Melbourne (1954 – no senior games). Camberwell 55 games (1952-53, 1955). Second Camberwell best and fairest 1952. Ex-Balwyn. Hawthorn 34 games (1949-50, 1952). Camberwell 17 games (1953). Essendon 62 games (1947-50 including 1949 premiership). Camberwell 38 games (1952-53). Camberwell 39 goals in 1952 season. Ex-Old Melburnians. Melbourne 9 games (1951-52). Carlton 10 games (1953-54). Ex-Northcote YCW. 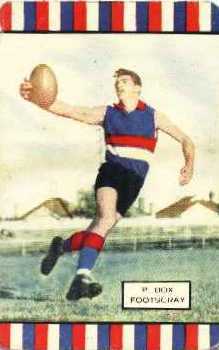 Fitzroy 4 games (1954-55). Camberwell 58 games (1957-61). Camberwell captain-coach 1959. Camberwell 49 games (1956-58). Hawthorn 6 games (1959). St.Kilda 6 games (1954-55). Camberwell 23 games (1955-58). Ex-Frankston. 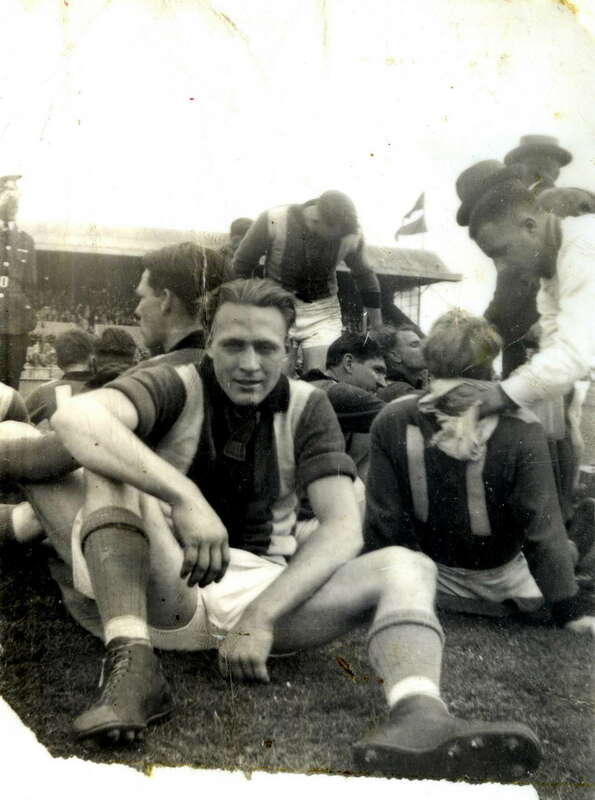 Fitzroy 5 games (1954-55). Camberwell 18 games (1956-57). 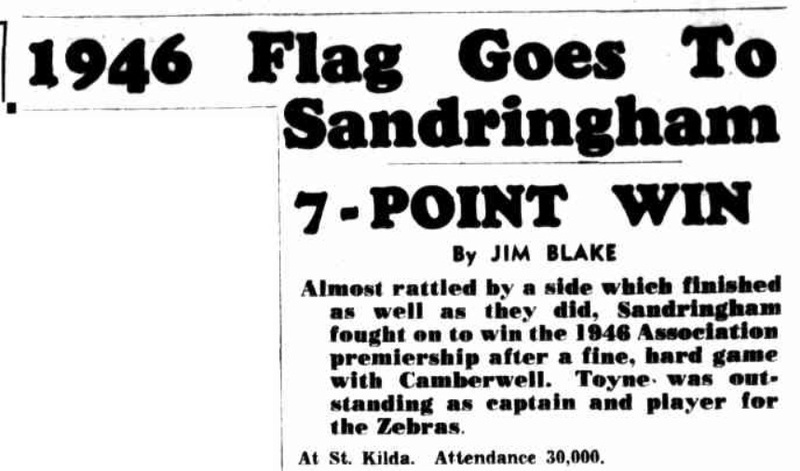 Represented (from Melbourne FC) VFL Seconds versus SANFL Seconds Adelaide Oval July 16, 1955. Melbourne 3 games (1957). Geelong 2 games (1958). Camberwell 8 games (1958). Ex-Melbourne Grammar. Melbourne 4 games (1950). Camberwell 35 games (1951-52). Camberwell 12 games (1958). South Melbourne 39 games (1959-62). Essendon 130 games (1913-15, 1918-25 including premierships 1923, 1924). Captain of Victoria 1921. Camberwell coach (1937-38, 1955). 1950 – Milgate 35, Stubbs 26, Bohan 21, Herbert 11, Schneider 11, Duff 11, Moore 9, Rosenbrock 8. 1951 – Milgate 69, McFee 20, Schneider 16, Moore 13, Rochford 12, Bohan 12. Hayes 12, Rosenbrock 12, Little 10. 1953 – McFee 35, Bohan 31, McGuinness 17, Hedley 15, Duff 9, McKenzie 9. 1954 – McFee 33, Holyoak 24, Tempany 16, Allsop 15, Scott 15, Dugdale 13, McGuinness 12, McCombe 9, Duff 9. 1955 – Hedley 27, Schneider 20, McGuinness 17, Matthews 15, Dugdale 9, Allsop 9, Tempany 9, Sabbatucci 9, Holyoak 8, Turnbull 8, Young 7, Benbow 7, Hayes 5, Lane 4, Wright 4, Milne 3, Mason 3, West 3, McFee 2, Duff 2, Kilby 1, Heil 1, Cooke 1, McKaige 1, E.Johnson 1, Alway 1, Farrell 1, Tobias 1, K.Johnson 1. 1956 - McGuinness 38, Tempany 19, Coleman 19, Dugdale 17, Matthews 10, Watts 9. 1957 - Higson 45, McGuinness 32, Coleman 17, Holyoak 16, Mason 13, Skalberg 12, Dugdale 10, Watts 9. 1958 – Higson 33, McGuinness 28, Coleman 23, Whitten 22, Mountain 12, Rice 11. 1959 – Freiberg 38, Seymour 27, Higson 11, Eades 11, B.Johnson 7, K.Johnson 7, Ellis 6, M.Chambers 6, Skalberg 5, Commons 4, Whitten 4, Bennie 4, K.Chambers 3, Muir 3, McPherson 2, Whiting 2, Betheras 1, Edwards 1, Castles 1, Watts 1, Simon 1, Kilpatrick 1, K.Douglas 1. 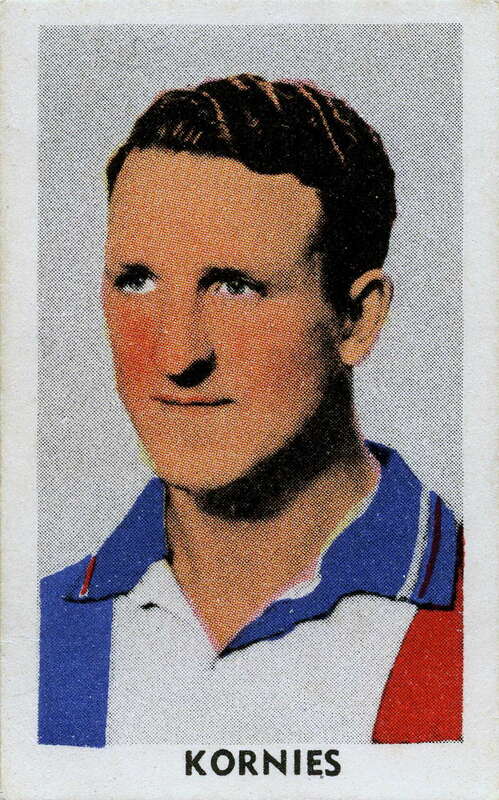 Note - Camberwell's Alan Philpott (16 games - see above) sadly died during the 1951 VFA season. J.Sharples (1950 – 19, 92); D.Wake (1950 – 18, 30); G.Styles (1950 – 15, 75); D.Kennedy (1950 – 14, 67); H.Gibbs (1950 – 10, 26); K.Herbert (1950 – 10, 81); A.Jensen (1950 – 8, 67); C.Ruddell (1950 – 8, 8); J.Donald (1950 – 7, 7); T.Finnegan (1950 – 6, 22); M.Hood (1950 – 5, 5); C.Hanman (1950 – 4, 16); R.Milne (1950 – 3, 3); D.Tehan (1950 – 3, 3); G.Davis (1950 – 2, 2); R.Horwill (1950 – 1, 5); G.Joubert (1950 – 1,13); M.Williams (1951 - 11, 11); K.Kane (1951 - 5, 5); E.Vogel (1951 - 4, 4); J.Archibald (1951 - 4, 4); R.Gribble (1951 - 3, 3); J.Diamond (1951 - 2, 2); J.Burkhalter (1951 - 2, 55); Ron Horkings (1951 - 2, 2); J.Martin (1951 - 2, 2); J.Kearney (1951 - 2, 2); F.Tate (1951 - 1, 1); J.Connell (1952 - 12, 12); D.Waters (1952 - 12, 12); D.Dunachie (1952 - 9, 9); G.Harriott (1952 - 8, 8); J.Bendle (1952 - 5, 10); D.Downes (1952 - 3, 3); F.Wain (1953 – 17, 17); A.Welch (1953 – 6, 6); W.Nicholson (1953 – 4, 4); L.McKenzie (1953 – 4, 4); R.Brown (1953 – 3, 3); R.Burchall (1953 – 3, 3); B.Tilley (1953 – 2, 2); R.Cunningham (1954 – 17, 17); J.Douglas (1954 – 14, 14); N.Black (1954 – 13, 13); E.Jarrard (1954 – 12, 12); G.Dennison (1954 – 9, 9); A.McCulloch (1954 – 5, 5); W.Lynch (1954 – 4, 4); A.Richardson (1954 – 3, 3); R.Burr (1954 – 2, 2); J.O’Shannessy (1954 – 1, 1); J.Ford (1954 – 1, 1); P.Deagan (1955 – 15, 15); P.Heil (1955 – 3, 3); K.McKaige (1955 – 5, 5); R.Cooke (1955 – 2, 2); Tobias (1955 – 3, 3); D.Donaldson (1956 – 11, 11); R.Flinton (1956 – 10, 10); M.George (1956 – 9, 9); G.Walker (1956 – 8, 8); M.Hellmrich (1956 – 6, 6); R.Jackson (1956 – 6, 6); R.Rochford (1956 – 3, 3); G.Eades (1956 – 3, 3); P.Taylor (1956 – 2,2); D.Dossor (1956 – 2, 2); A.Edwards (1956 – 1, 1); R.Elleray (1956 – 1, 1); B.Hegarty (1957 – 18, 18); S.Lanning (1957 – 10, 10); R.Bloodworth (1957 – 9, 9); C.Bock (1957 – 7, 7); D.McPhail (1957 – 6, 6); G.Kenneally (1957 – 4, 4); R.Stanborough (1957 – 4, 4); E.Johnson (1957 – 3, 3); W.Egan (1957 – 2, 2); K.Piper (1957 – 2, 2); K.Horne (1957 – 1, 1); H.Smith (1957 – 1, 1); D.Grace (1957 – 1, 1); P.Box (1958 – 18, 18); I.Whitten (1958 – 18, 18); C.Douglas (1958 – 18, 18); G.McIsaacs (1958 – 18, 18); B.Johnson (1958 – 16, 16); A.Moran (1958 – 15, 15); P.Rice (1958 – 12, 12); M.Young (1958 – 9, 9); J.McDonald (1958 – 9, 9); T.Mountain (1958 – 8, 8); D.Clarke (1958 – 7, 7); C.Lonsdale (1958 – 6, 6); B.Bennie (1958 – 4, 4); L.Symons (1958 – 3, 3); R.Brown (1958 – 3, 3); G.Hambrook (1958 – 1, 1); F.Batey (1958 – 1, 1). 1. Marc Fiddian, Well Done Camberwell – The Camberwell v Oakleigh Football Saga, 2016, pp. 32-35. 2. Former Essendon star Wally Buttsworth was Camberwell’s initial appointment as 1945 captain-coach but Essendon refused to clear him. 3. 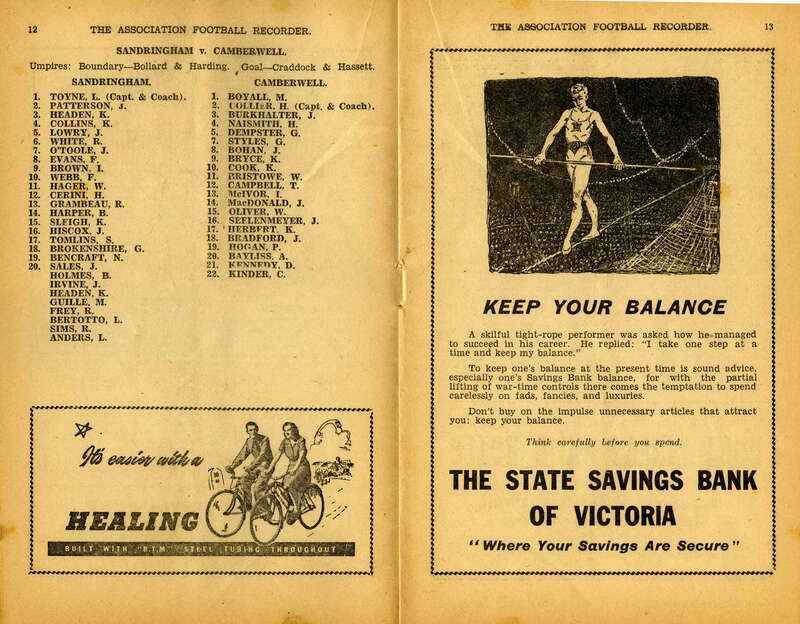 The game at Camberwell was the only VFA game played that day – the Monday (June 18) Public Holiday. 4. Camberwell’s big names – Boyall, Collier and Bradford – played in the match. Even more interesting is the fact that Collingwood’s Jack Regan and Williamstown's Ron Todd were roped in to play, along with Oakleigh’s 1945 Liston Trophy winner Eric Beard. 5. Clinton Walker, A Football Life, Pan Macmillan, Sydney, 1998, pp. 43-50. 6. The Tricolours hit the front late in the match and were four points in front with five minutes of play (plus ‘time-off’) remaining. 7. Jim Blake, Collier's Part in Rise of Camberwell, The Sporting Globe, n.d (1946?). 8. Undated, unidentified newspaper cutting, Thelma Baker scrapbook 1945-69. 9. 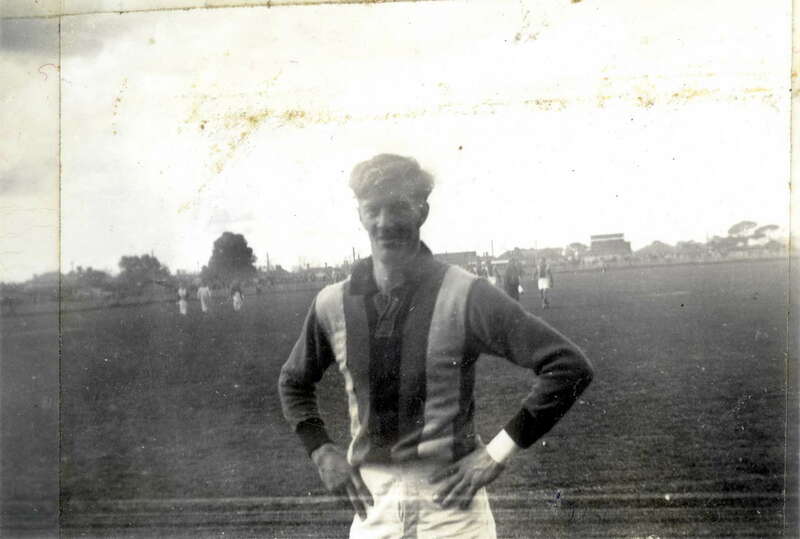 Clinton Walker has suggested that in spite of its poor record Sandringham were one of the Association’s best supported sides in the forties and wore ‘one of the handsomest of all Australian football strips’. Sandringham finished eleventh in 1945. 10. For further comment, see Marc Fiddian, The VFA – A History of the Victorian Football Association 1877-1995, Melbourne, 2004 (First Edition), p. 141; Marc Fiddian, The Roar of the Crowd – A History of VFA Grand Finals, 1987, p. 50. 11. 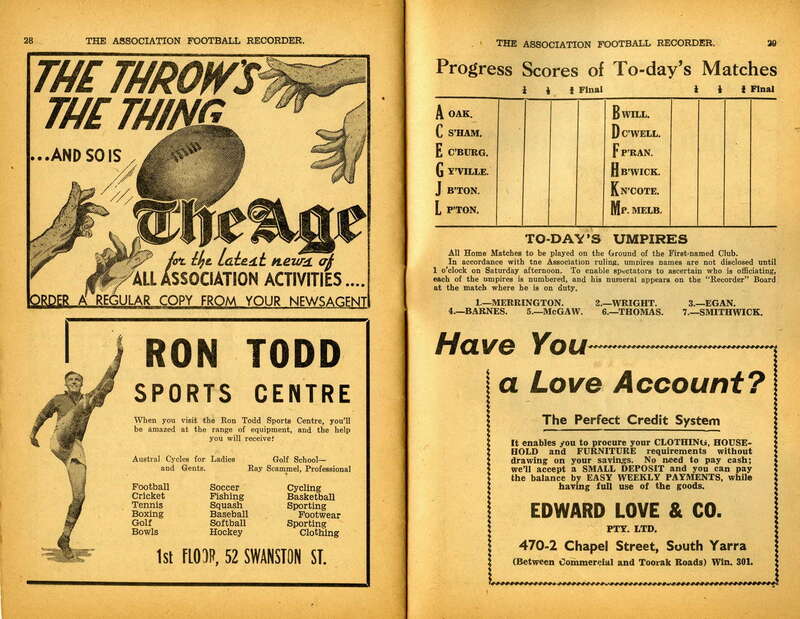 A small crowd of 4,500 saw Williamstown win 15.11 to 13.16, with Ron Todd kicking five goals on Seelenmeyer. McIvor, Boyall and Bradford stood out for Camberwell. 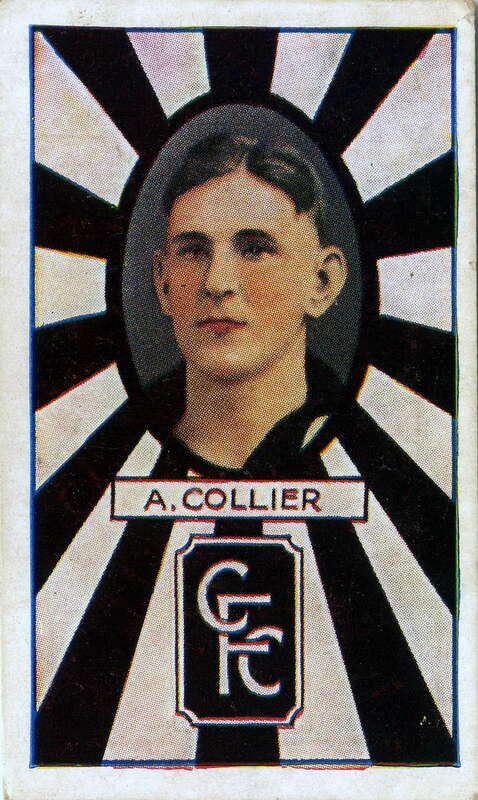 It was the last game in senior football for the great Albert Collier, sadly replaced at half-time with injured ribs. The ‘Players’ Trip Committee’ was headed by Marcus Boyall (Chairman) and Ray Bond (Secretary). Bond reported that ‘Camberwell players (were) not good sailors and the ship’s rail was well patronised’. 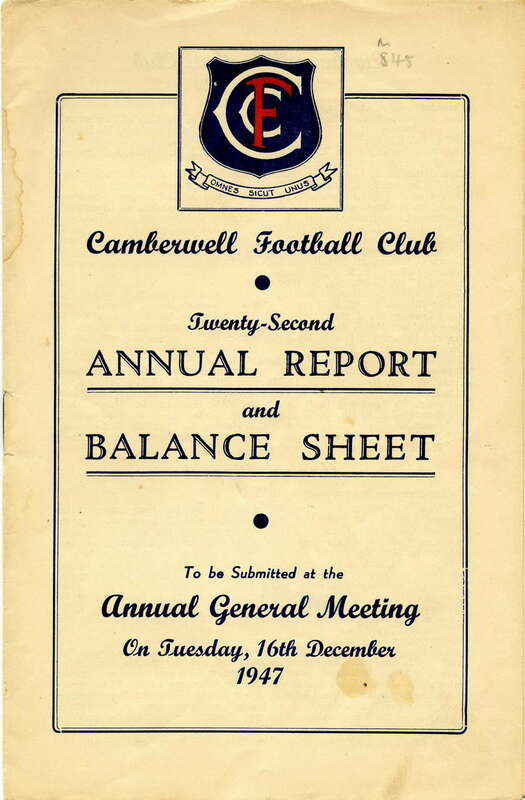 See 1946 Camberwell Football Club Annual Report. 12. Cliff Hanman (Sandringham footballer), cited Clinton Walker, A Football Life, op.cit, p. 51. 13. One can imagine the excitement. 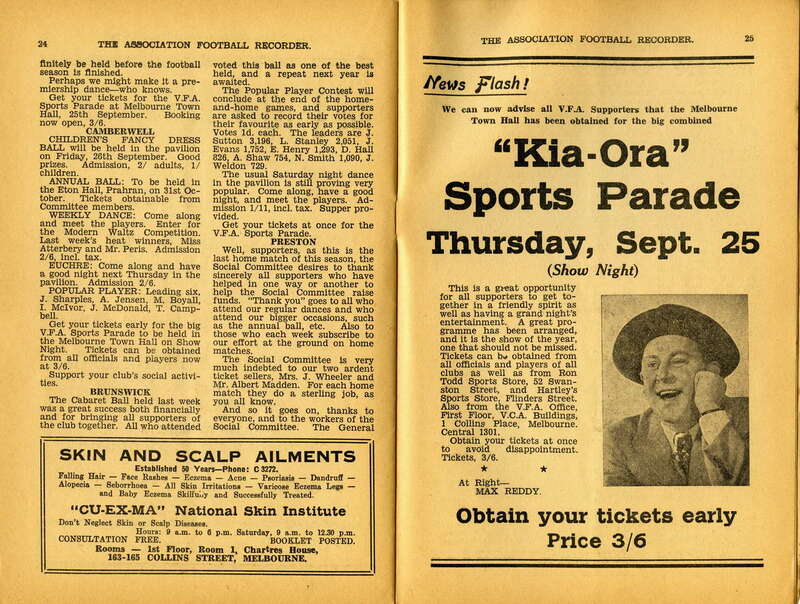 The program included an interview with President Gil Hendrie and Coach Albert Collier, community singing, a ‘Players Quiz’, a ‘Players Drama’, and in the second half, a ‘Players Ballet’. Hubert Opperman performed on the rollers. 14. 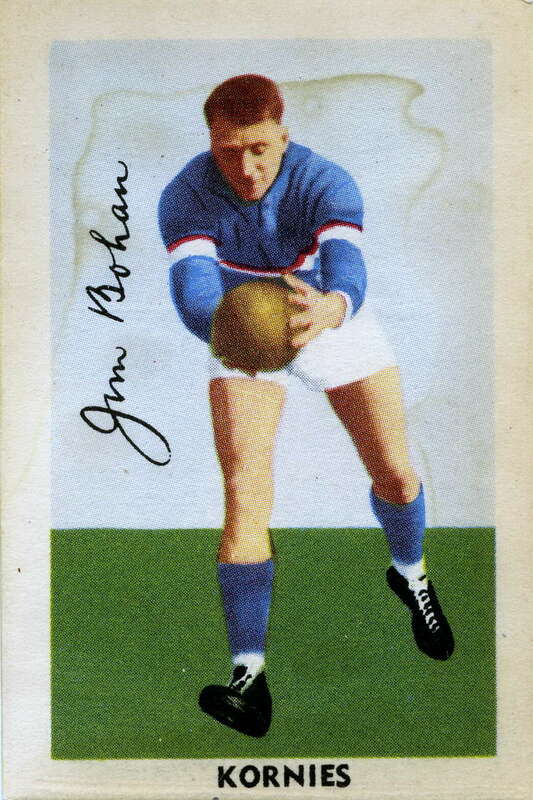 Jim Bohan played 131 games and kicked 145 goals for Hawthorn and was twice best and fairest (1943, 1945). Ultimately he would be named as centreman in the Hawthorn Team of the Century. 15. The nickname ‘Wells’ seems to have come into vogue in the late forties and early fifties, largely replacing the previously preferred moniker ‘The Tricolours’. 16. See Marc Fiddian, Well Done Camberwell – The Camberwell v Oakleigh Football Saga, 2016; Football Doctor Prescribes, Sporting Life, May 1950, pp. 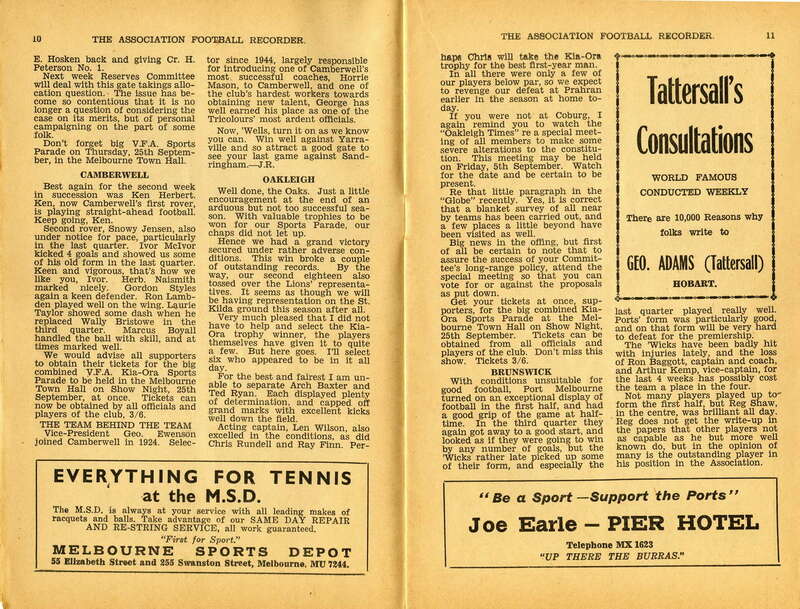 49-50; Dr Hartnett Discusses Unified Control, Oakleigh Football Club Year Book 1950, pp. 35, 37. For biographical details, see Marc Fiddian, The Pioneers – 100 Years of Association Football, VFA, 1977, pp. 141-142. Apparently Hartnett was also behind the move to introduce Box Hill and Moorabbin to the VFA in 1951. 18. 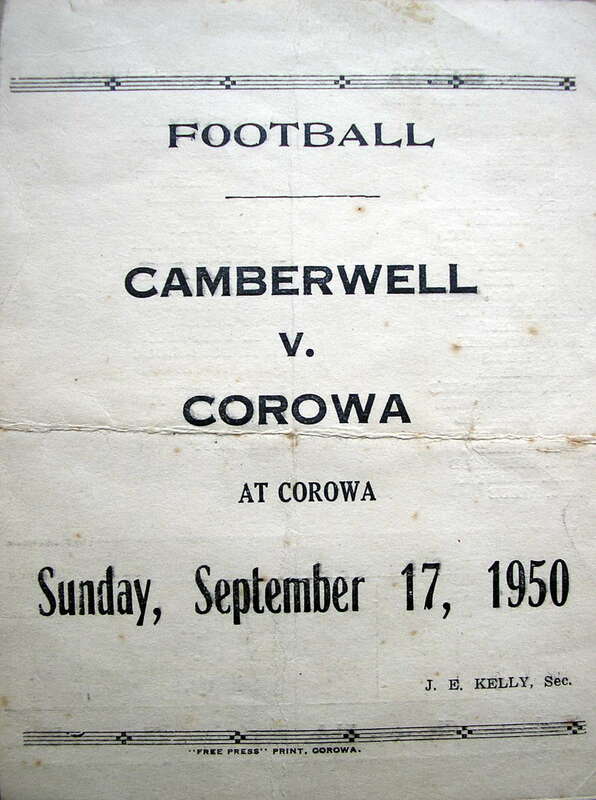 See Camberwell Football Club Annual Report 1951; Camberwell Football Club Annual Report 1952; Camberwell Football Club Annual Report 1954; Australian Rules Football Schism (1938-1949) (Wikipedia). Given Camberwell’s strenuous opposition to the ANFC affiliation, and the likelihood their own identity (Hartnett) had actually initiated it, one is bemused by the club’s 1952 description of VFA President Hartnett as a ‘tower of strength’. 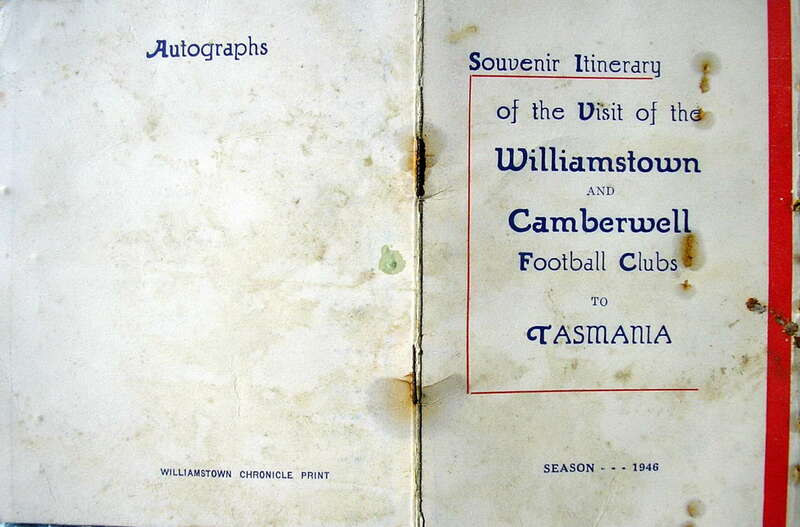 See Camberwell Football Club – Souvenir History, 1952 (Introduction by C.S.Greenwood, President), p. 17. (See pp. 43-44 for the article by VFA Secretary Harold Snook). In May 1949, Len Toyne, complaining about lack of protection from the umpires, resigned as Sandringham captain-coach and blasted the VFA for its ‘pathetic umpiring and management’. He was probably right. See The Argus, May 20, 1949. 19. Defeating Port Melbourne at Port Melbourne was never a good idea if you wanted your supporters to get home in one piece. Port Melbourne supporters did not take kindly to being beaten on their home ground. 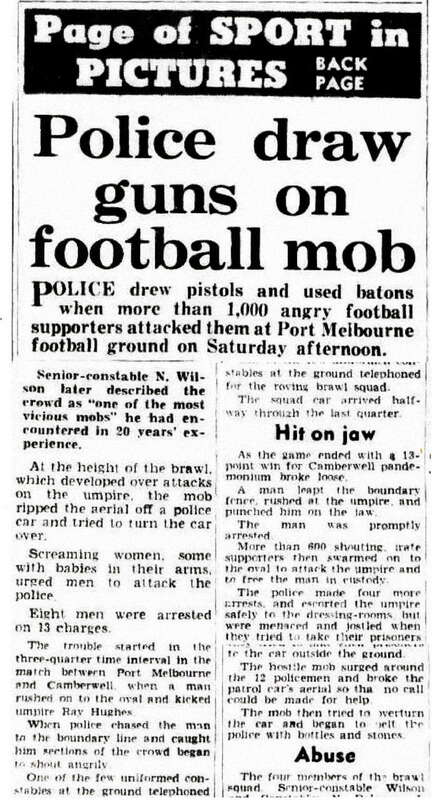 On this particular occasion, according to The Argus, police drew pistols and used batons when more than 1000 angry football supporters attacked them. The trouble started in the three-quarter time interval when a man rushed on to the oval and kicked the umpire. (See The Argus article pictured below). 20. 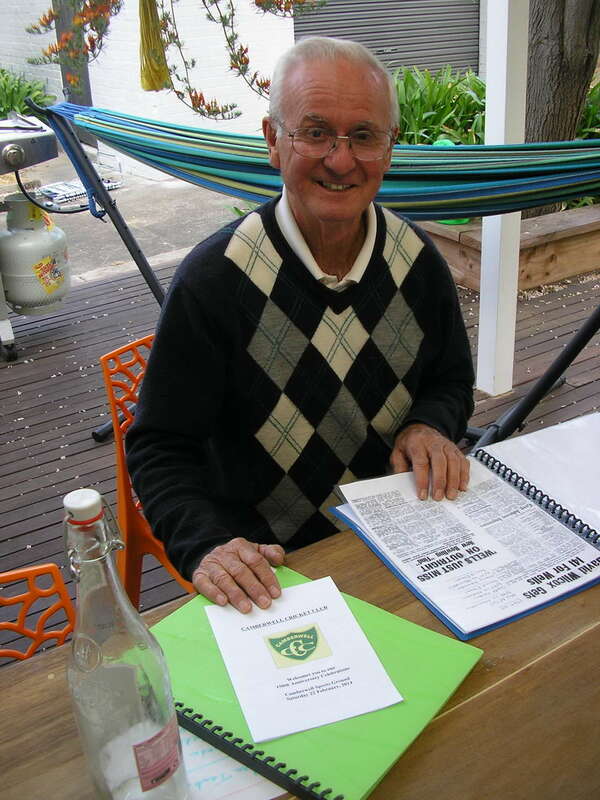 See Marc Fiddian, The VFA – A History of the Victorian Football Association 1877-1995, Melbourne, 2004 (First Edition); Marc Fiddian, Well Done Camberwell – The Camberwell v Oakleigh Football Saga, 2016. See the work immediately above (pp. 68-69) for a profile of Hartnett. Fiddian recalls the charge of ‘megalomania’ being levelled by a fellow VFA official. 21. See Marc Fiddian, The VFA – A History of the Victorian Football Association 1877-1995, Melbourne, 2004 (First Edition), p.142. See also ‘Stars of the Fifties’ below. 22. See Camberwell 1958 Annual Report. 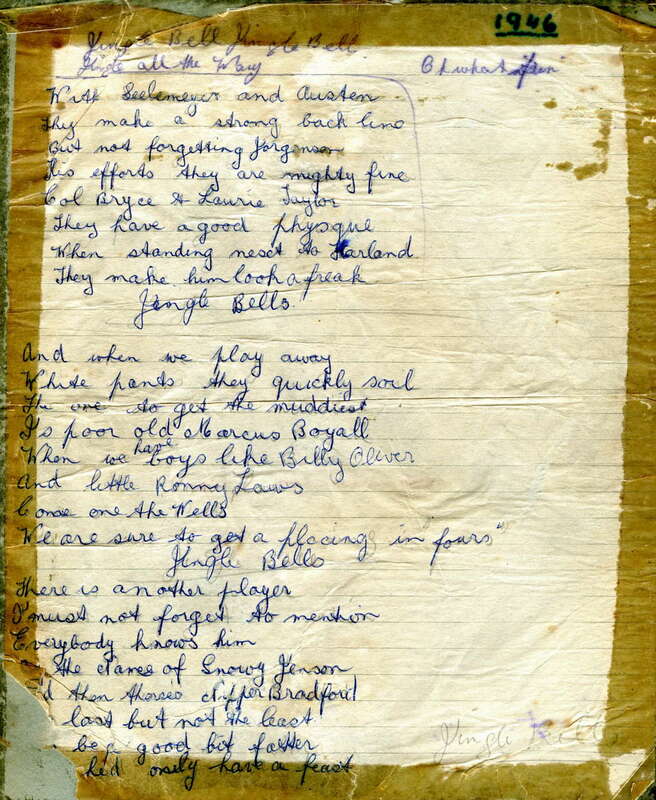 At the start of the 1958 football season I had only been living in Burwood for twelve months and my heart therefore also remained loyal to the VFA club I had grown up with – Camberwell. My 1958 exercise book devoted considerable space to the results of Camberwell’s season. I recorded the weekly goal kickers for the Wells, the best players (presumably based on newspaper reports), and the training list. Note that Terry Mountain, fresh from Geelong, kicked five goals in Round Thirteen. Camberwell’s stars were Liston Trophy winner Ken Ross, Brownlow Medallist Peter Box, and Geoff Mason. One page in the exercise book recorded the weekly Camberwell results (match, result, result by, umpire, best). On another page I kept a table of VFA teams’ round-by-round ladder positions. After eight rounds Camberwell occupied top spot on the VFL ladder – after winning seven of their first eight matches. By Round Sixteen however the ‘Wells’ had slipped to seventh. 23. Knocked back by Camberwell Council for 1955, Hakoah and J.U.S.T then tried again for 1956. 24. Among others, Camberwell sought the services of George Hams, formerly of Collingwood. 25. Indeed even the Camberwell players came in for some criticism in 1958 for not sufficiently supporting the club social functions. 26. 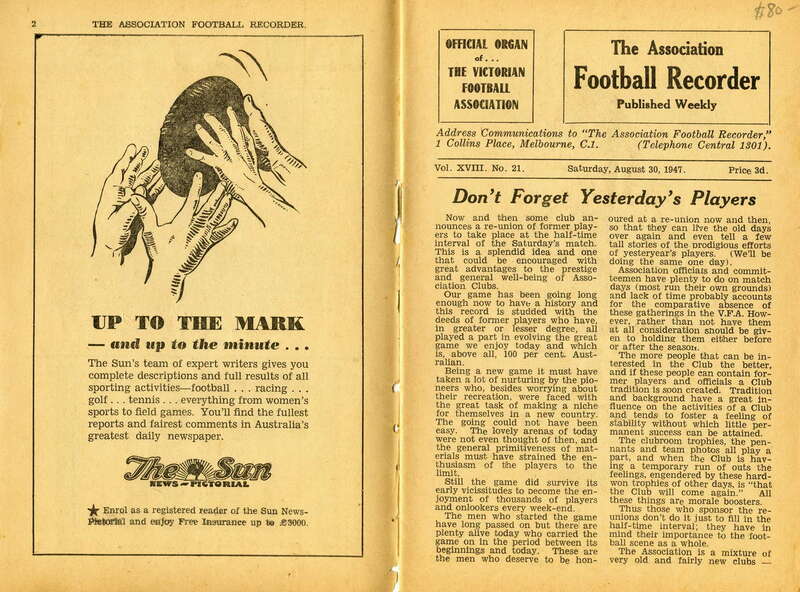 The first-ever VFA game to be televised was the Oakleigh-Preston match on May 25, 1957. 27. Holyoak’s last twelve months at Bowen Street were complicated. Not happy with Ken Ross, Holyoak asked Camberwell for a clearance at the end of the 1956 season. The Committee promised to release him if he played one more year. He again played brilliantly in 1957, won the Best Clubman Award, and was granted a clearance to captain-coach Kilsyth (Croydon-Ferntree Gully League) in 1958. 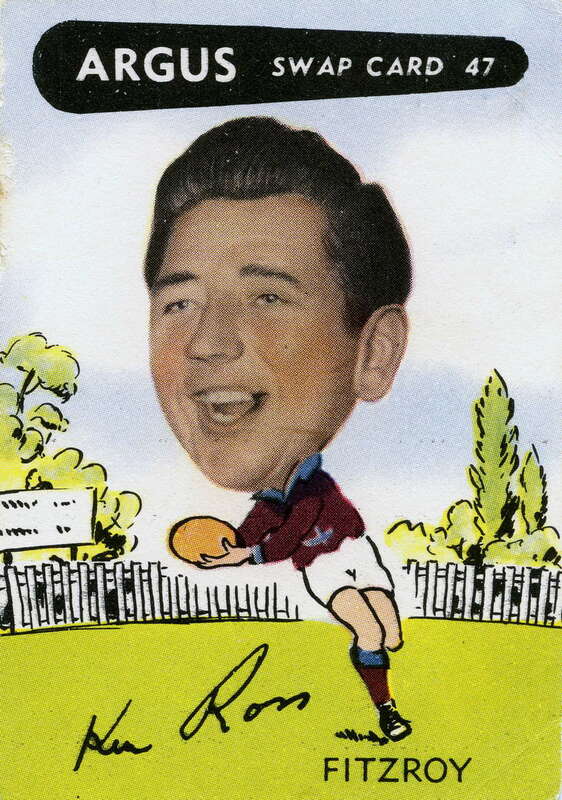 During the 1957 season Ross shifted Holyoak from the centre to centre half forward. 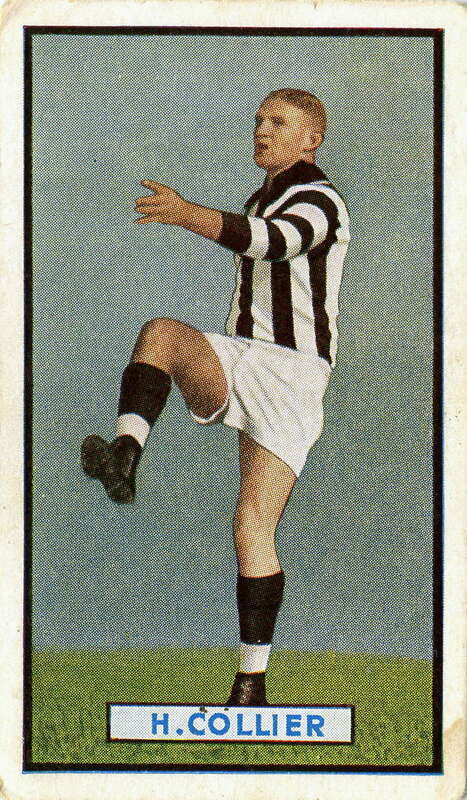 Marc Fiddian, in the 2004 first edition of his history of the VFA (The VFA – A History of the Victorian Football Association 1877-1995, p. 142), claimed that Holyoak told him in 1993 the move out of the centre in 1957 cost him the Liston Trophy. Holyoak, objecting strongly to the implication that he played for the Liston rather than the team, contacted Fiddian and demanded a retraction. Fiddian altered the wording in his second edition of the work, but still not to Holyoak’s satisfaction. In the early part of his career, before becoming a fixture in the centre, Holyoak often played at half forward or full forward. In 1954 he kicked 26 goals for the season, including seven against Sandringham at Beach Road in Round 14; in 1955 he kicked five goals at full-forward against Oakleigh; in 1957 he kicked four goals at centre half forward against Oakleigh (Round 16). In 1954 (at Oakleigh) Holyoak was reported for allegedly throwing the ball at Umpire Bailes, but got off. In another memorable incident involving Oakleigh, this time at Camberwell (July 16, 1955), Holyoak was struck (from behind) by Oakleigh’s Vic Hill, sparking an all-in brawl and police intervention. 28. 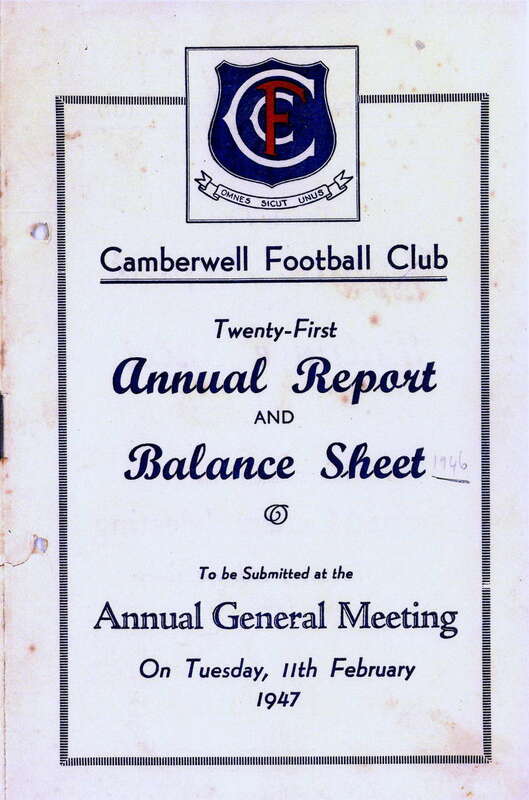 Camberwell’s Annual Reports for seasons 1955 and 1959 were not available and I have had to use other sources to establish players’ games for those two seasons. It was possible to deduce the 1955 figures from the Annual Reports of 1954 and 1956, from the Camberwell ‘Team of the Century’ book, and from 'Gap Chess Club'. Extra names (cited in the Camberwell ‘Team of the Century’ book as playing in 1955) were Charlton 4, W.Brookes 3, Douglas 3, Smith 2, Evans 1. ‘1959’ was much more difficult as the Camberwell 1960 Annual Report was not available either, making deduction impossible in this case. Nevertheless, using 'Gap Chess Club' and the Camberwell ‘Team of the Century’ book, I was able to establish the following figures for 1959 - B.Seymour (19), E.Higson (3), M.Chambers (15) L.Muir (15), W.McPherson (17), R.Whiting (8), R.Betheras (5), A.Edwards (5), R.Castles (7) C.Douglas (11), D.Clarke (3), A.Moule (17), N.Whetton 3, A.Dunne (4), J.Stenberg (5). The following also played for Camberwell in 1959: K.Freiberg, Eades, B.Johnson, K.Johnson, B.Ellis, O.Skalberg, M.Commons, I.Whitten, B.Bennie, K.Chambers, N.Watts, K.Kilpatrick, Long, E.Chaplin, and possibly Simon, Chapman, Northcote and Sharp.